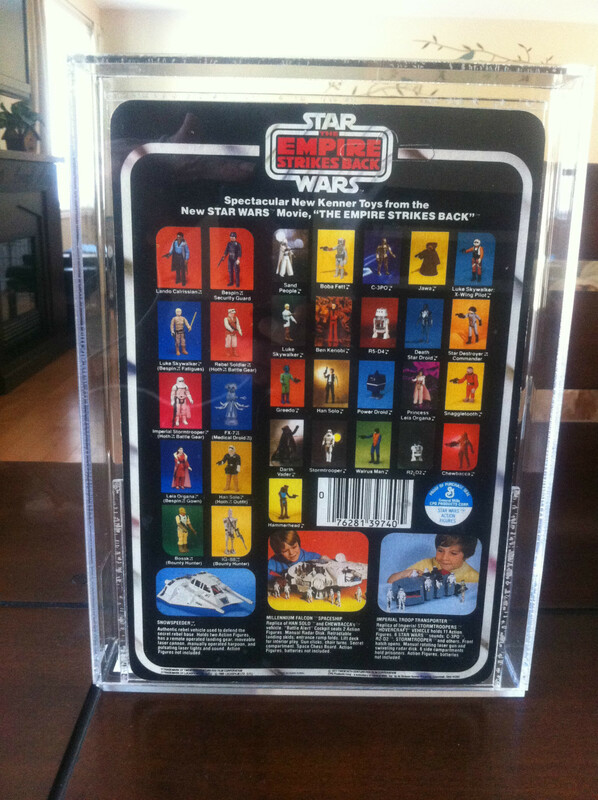 As I work my through these figures for the Market Watch I keep learning (correcting mistakes from my childhood). 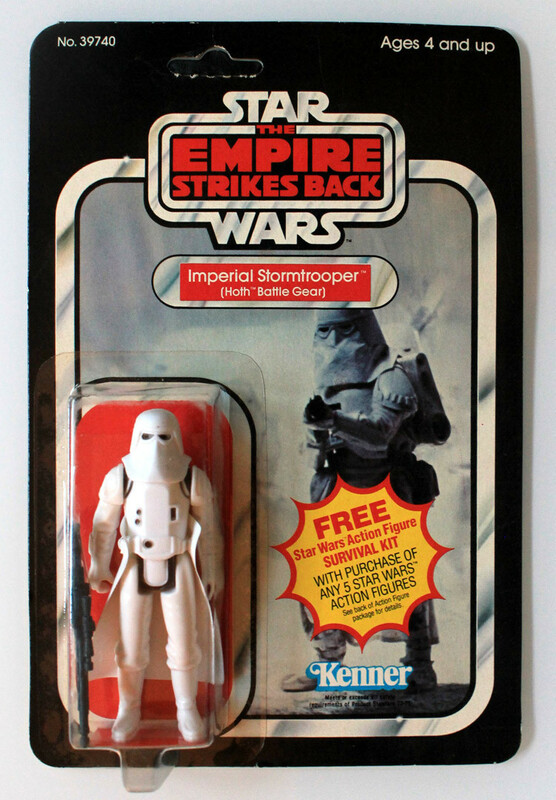 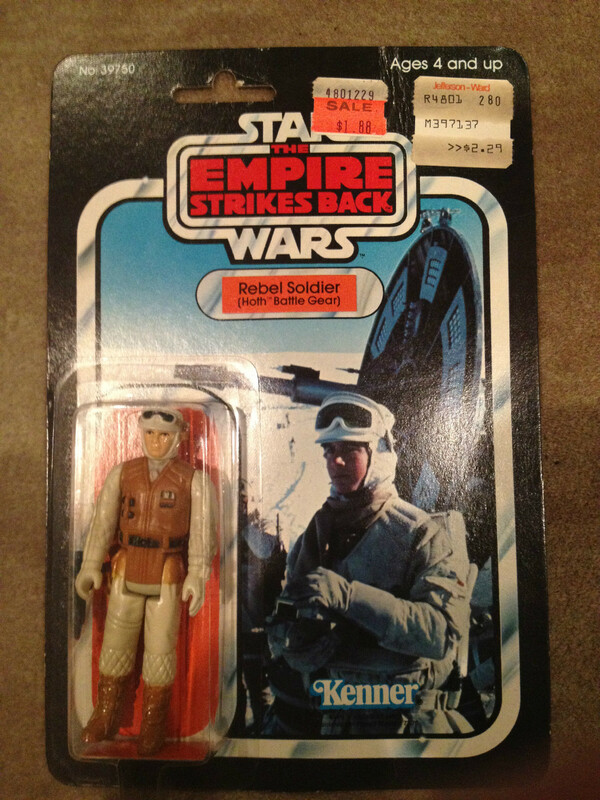 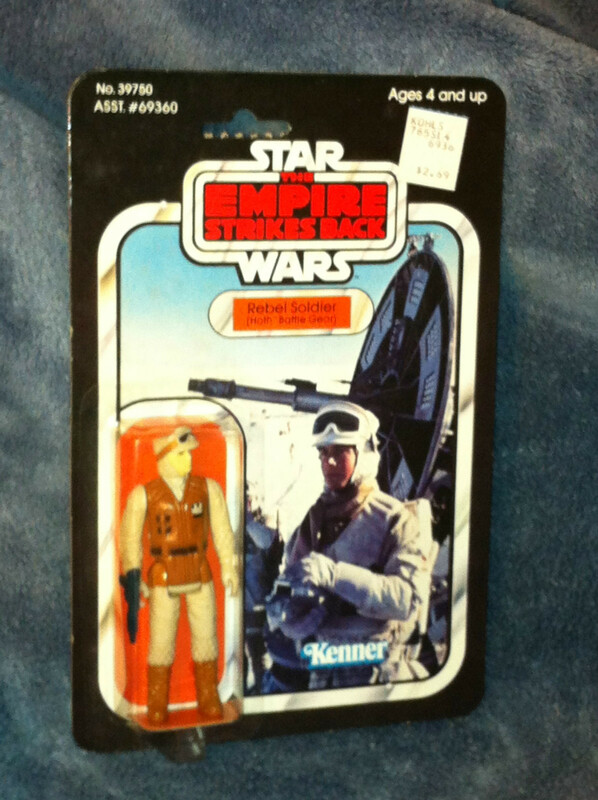 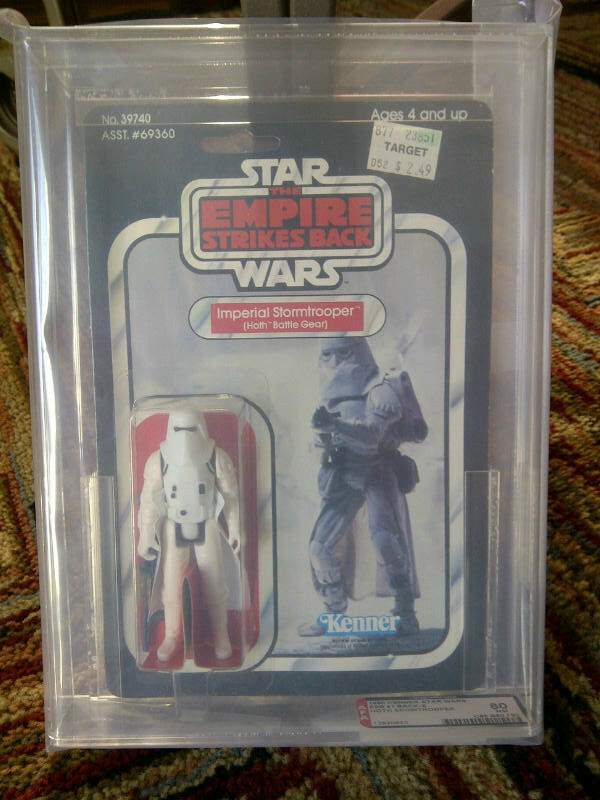 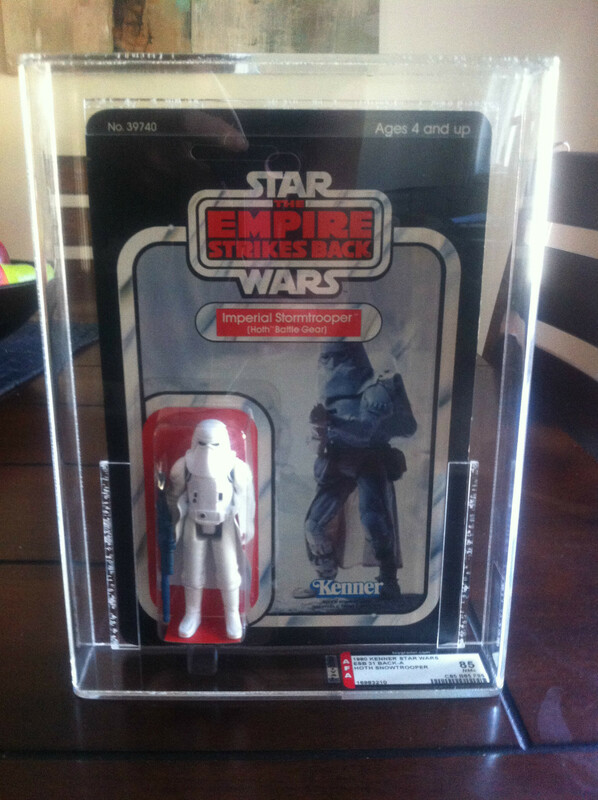 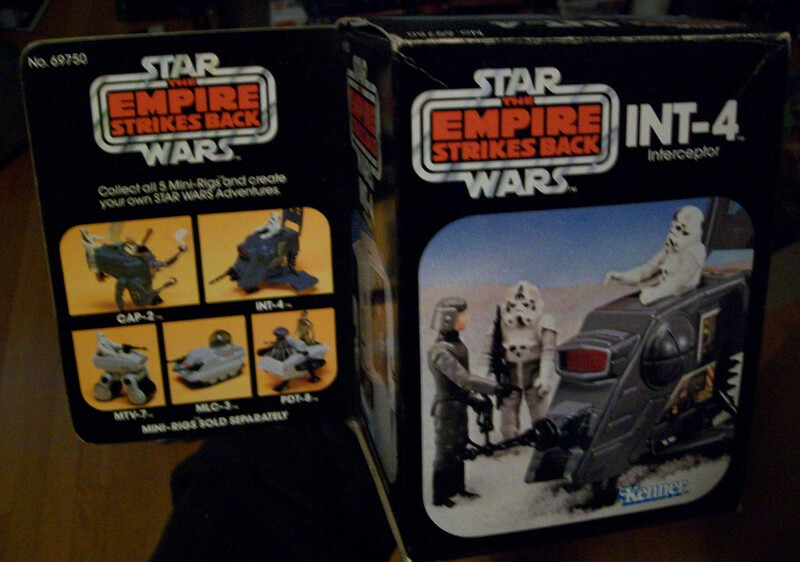 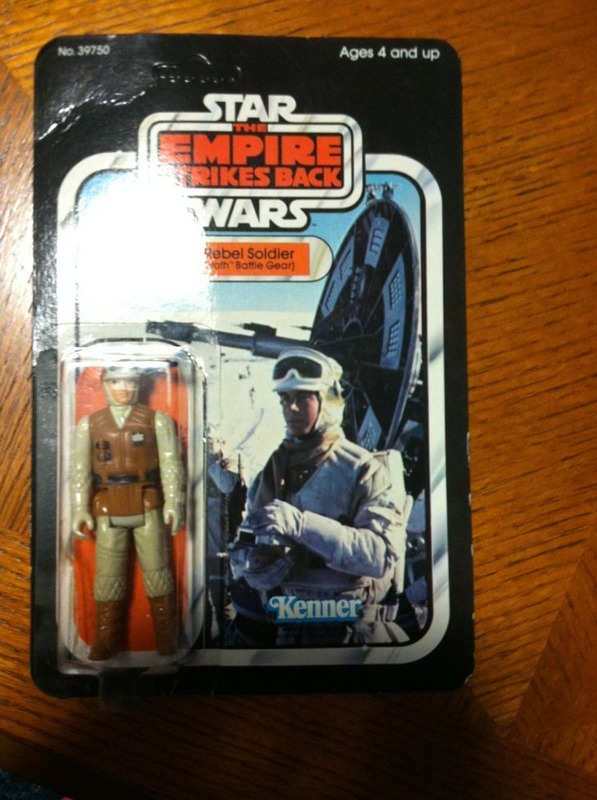 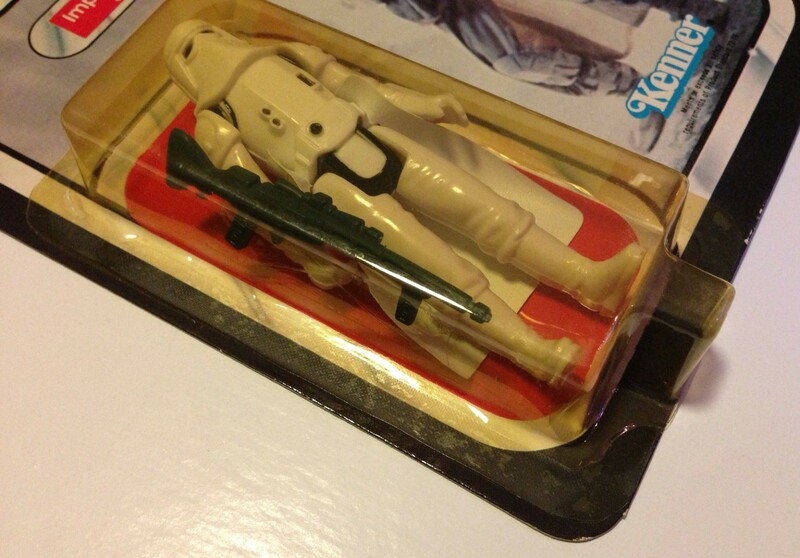 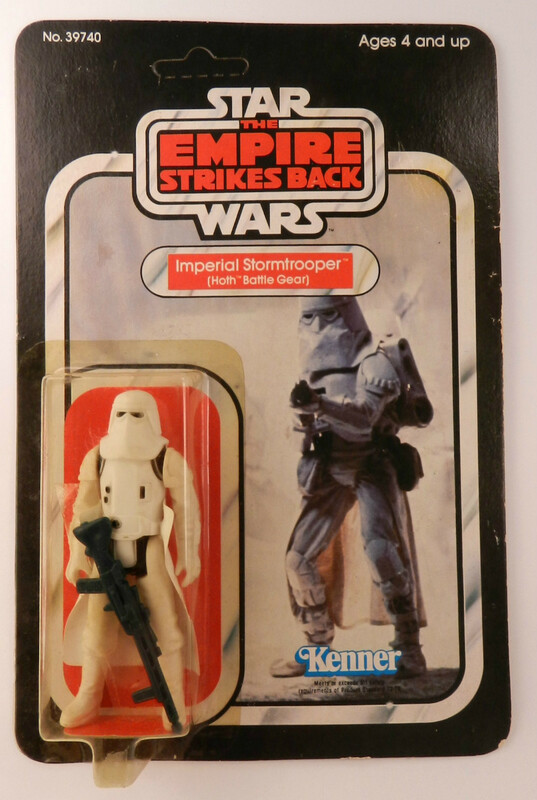 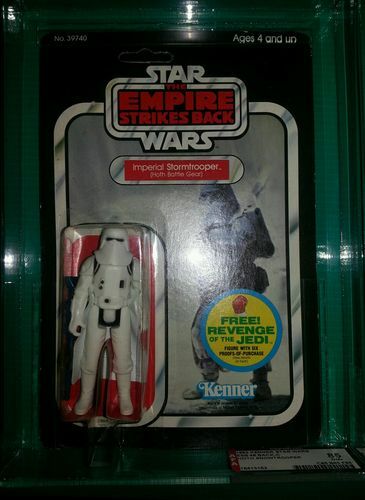 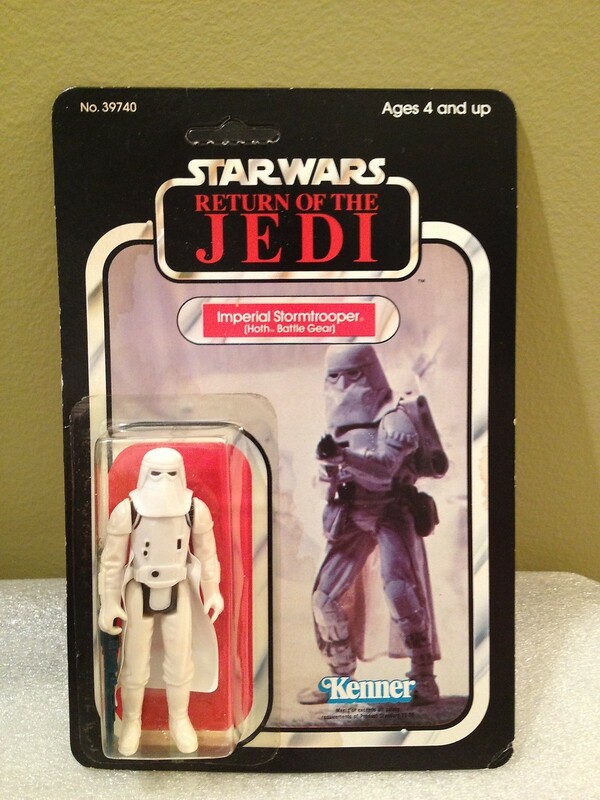 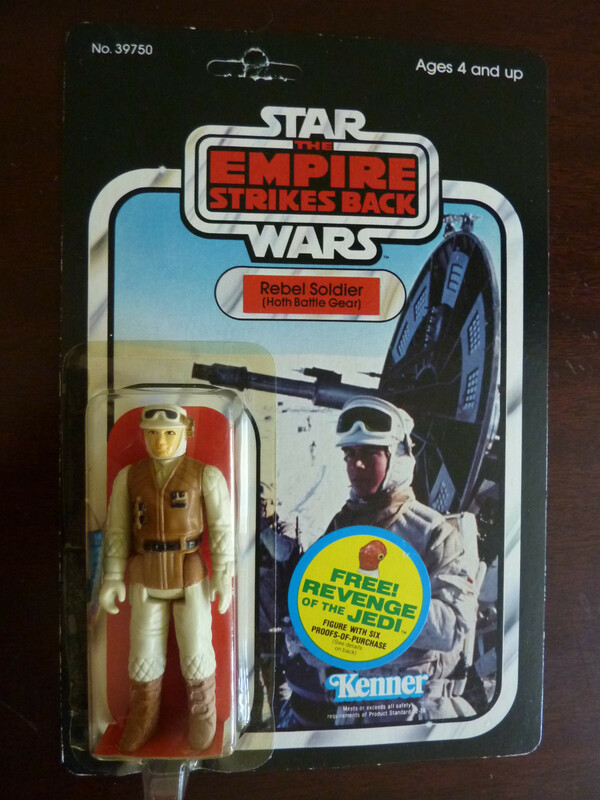 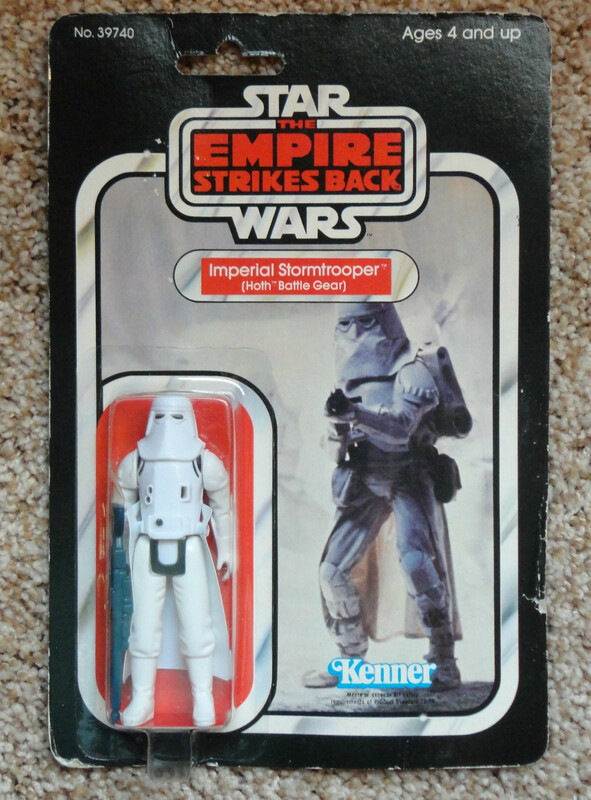 I would have bet this figures was the “Snowtrooper” but all the cardbacks I came across for the MW have him clearly labelled as “Imperial Stormtrooper”. 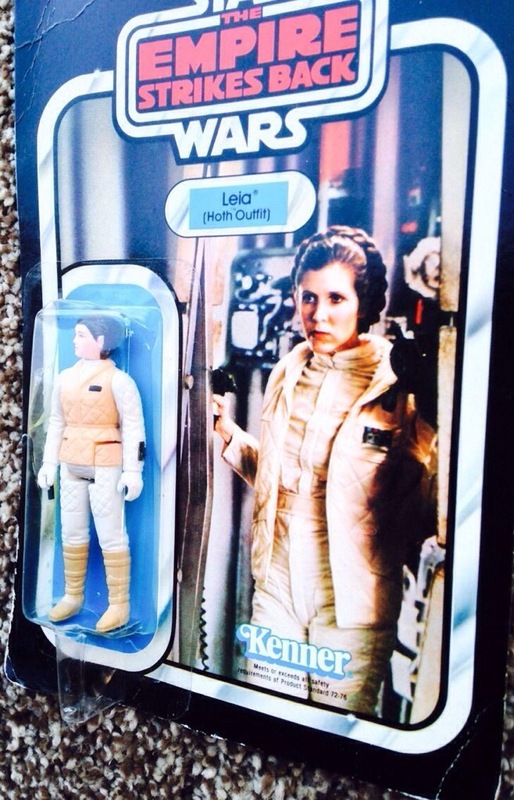 Oh well – correction made !! 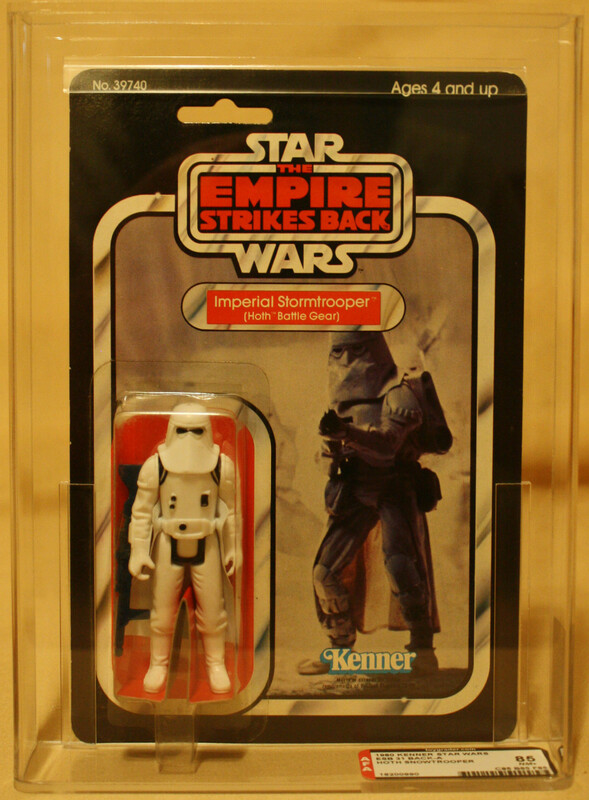 It’s also interesting that the word “Imperial” is used, but the traditional Stormtrooper didn’t get the “Imperial” pre-ceding his name. 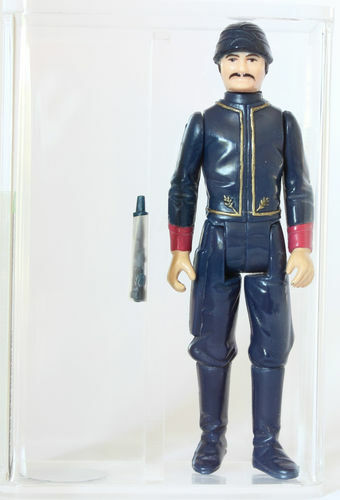 Anyway – just some observations. 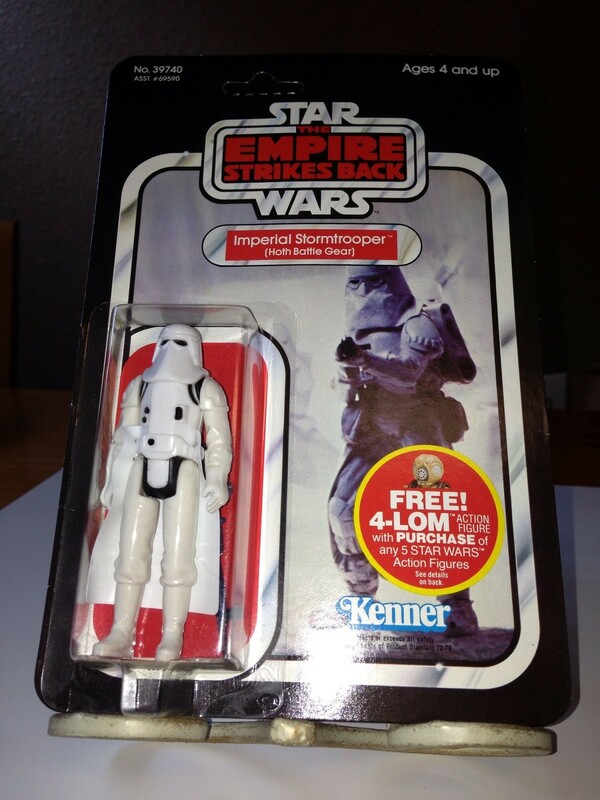 In this month’s summary I couldn’t help myself and branched out a little to some Imperial Stormtrooper related items. 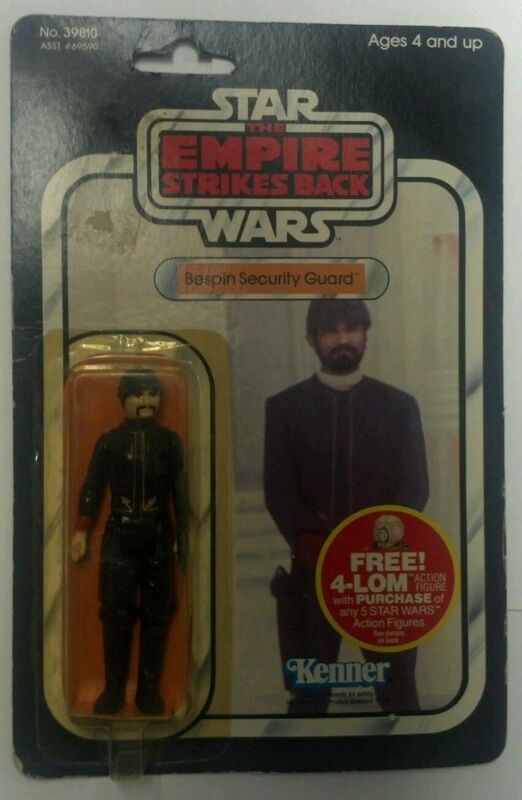 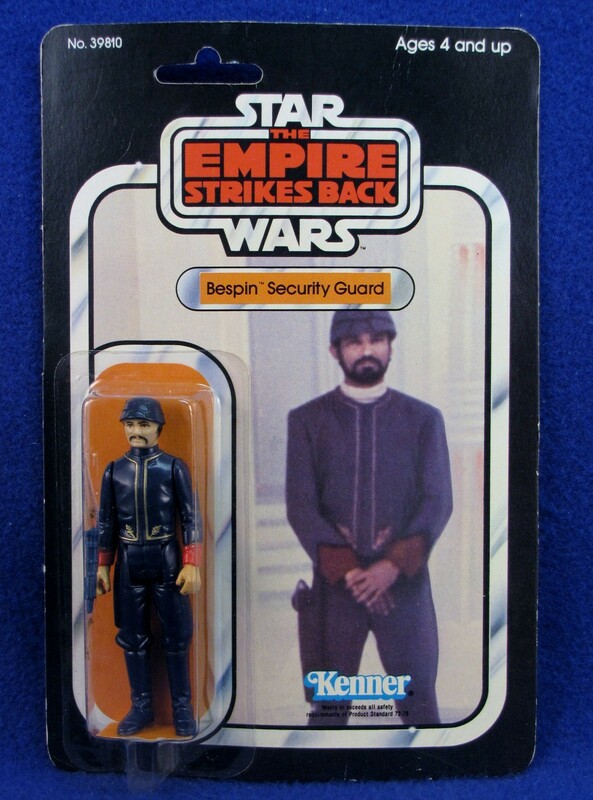 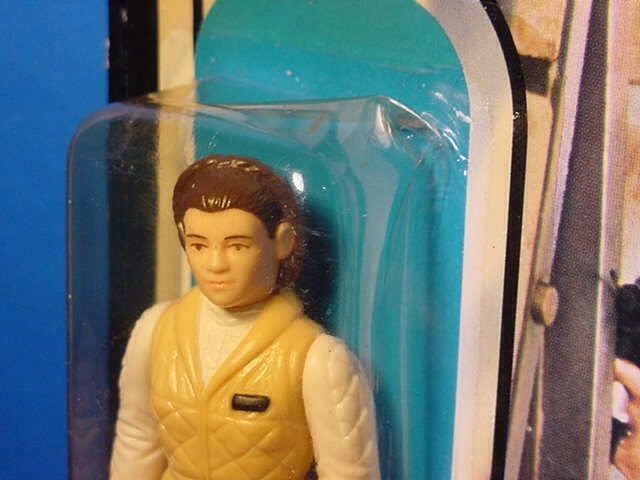 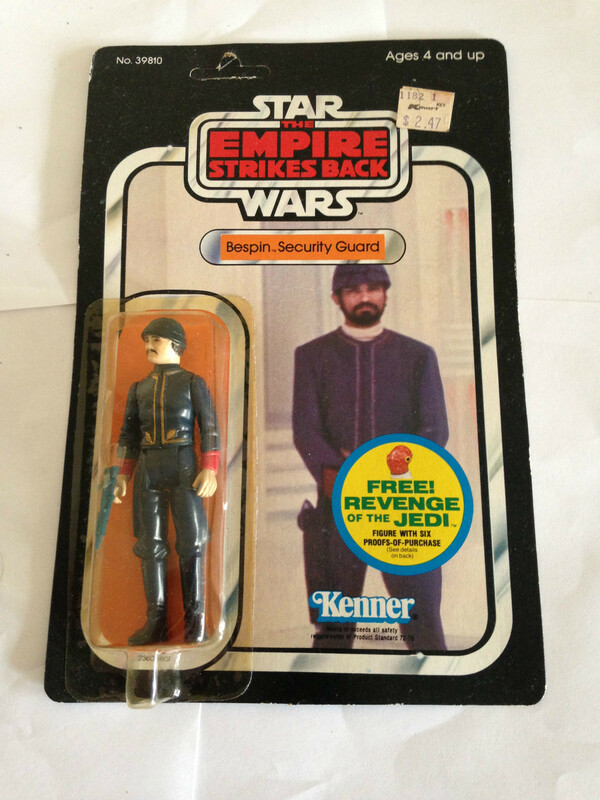 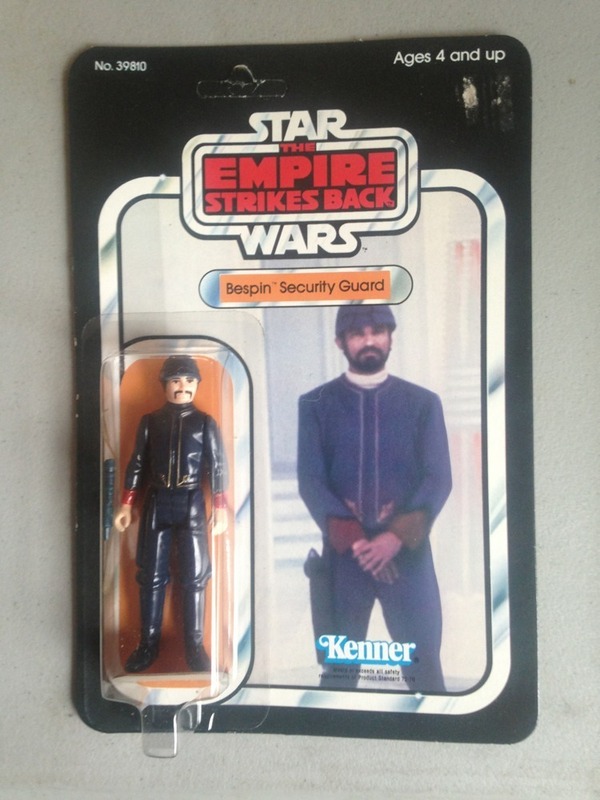 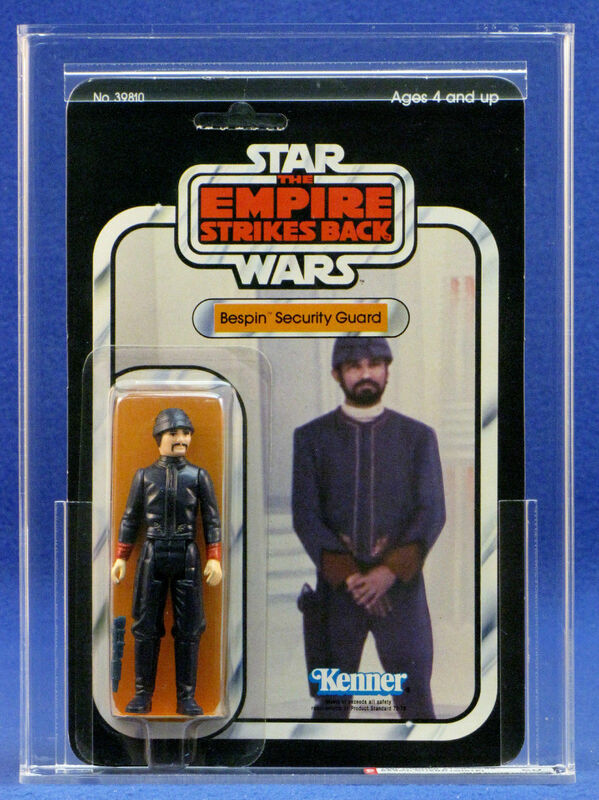 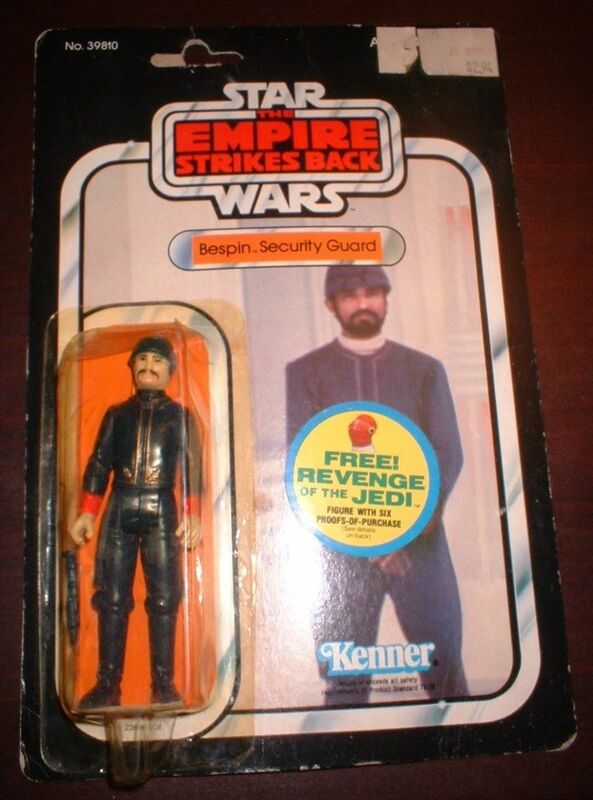 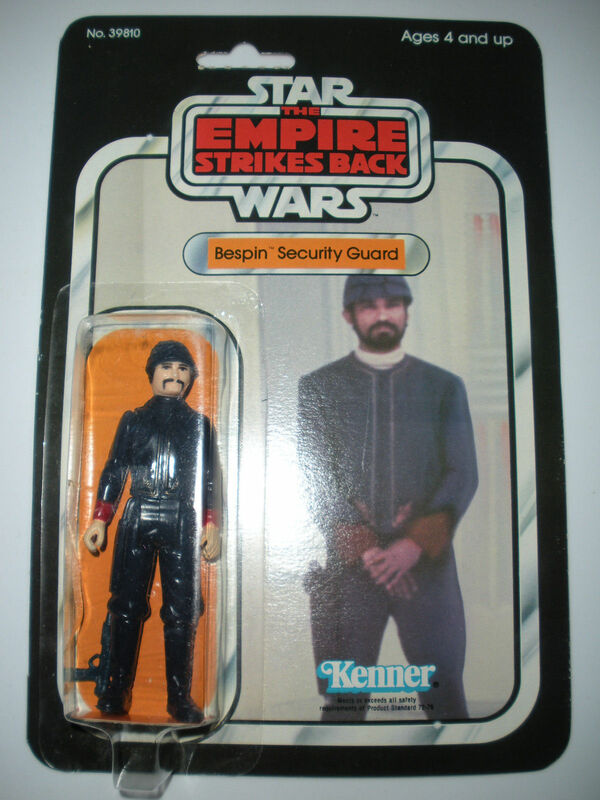 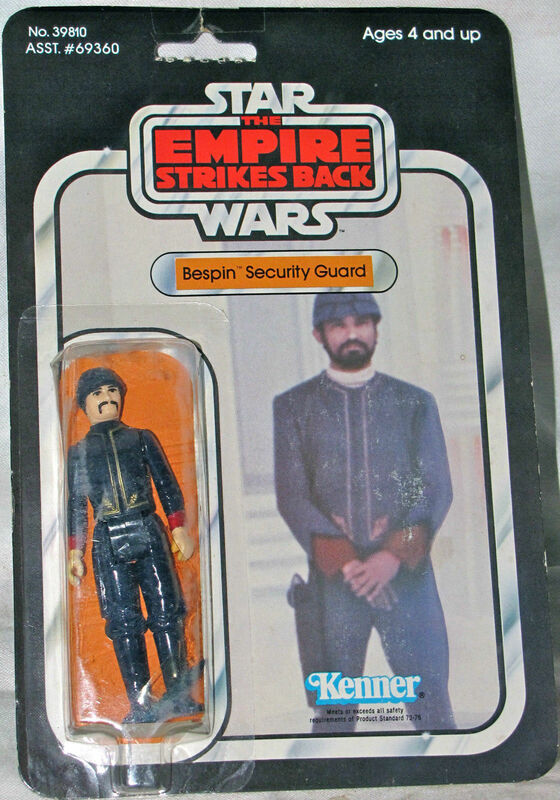 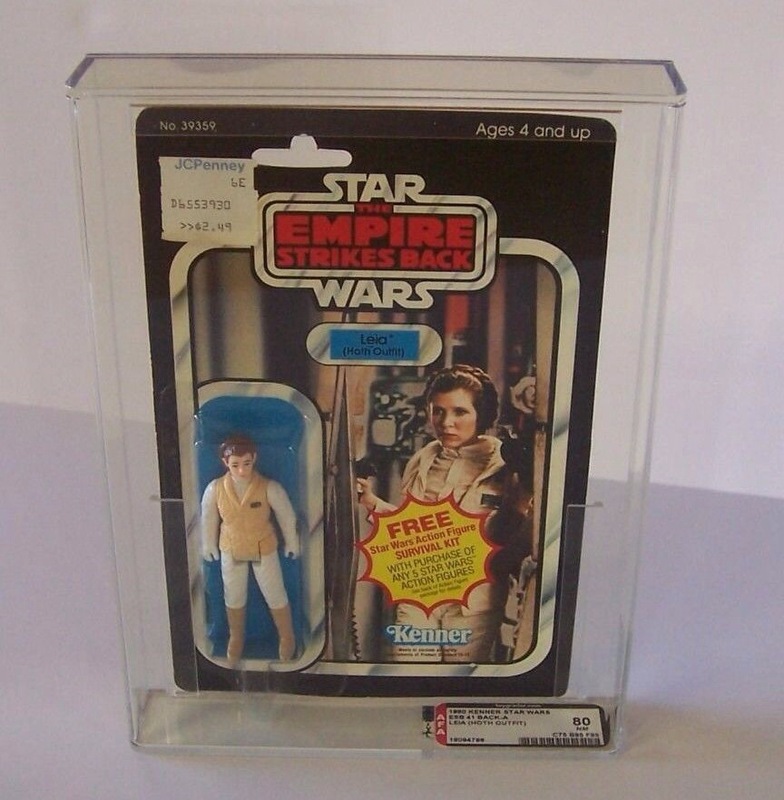 This was the only figure I had as a kid in multiples. 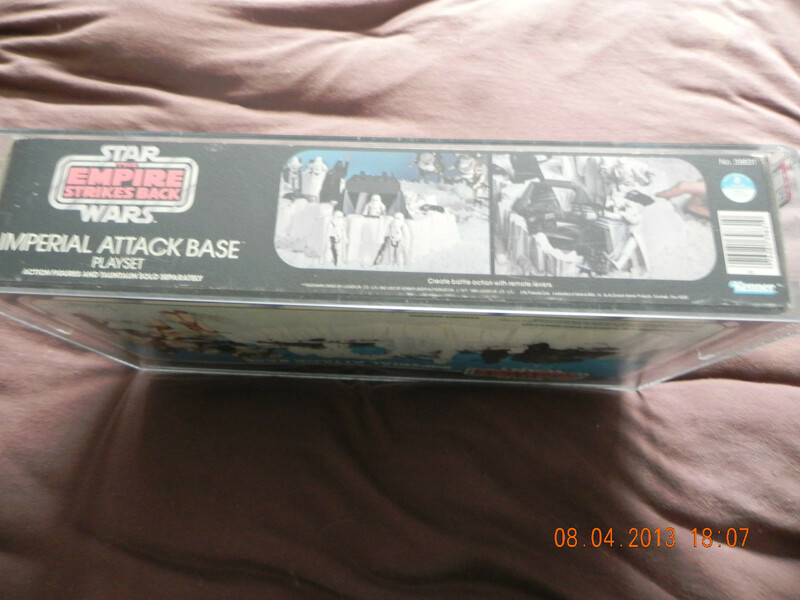 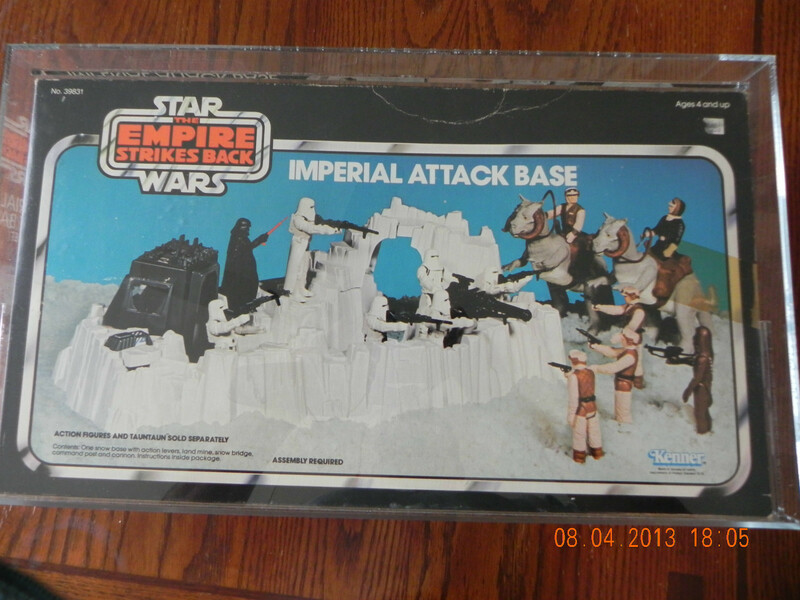 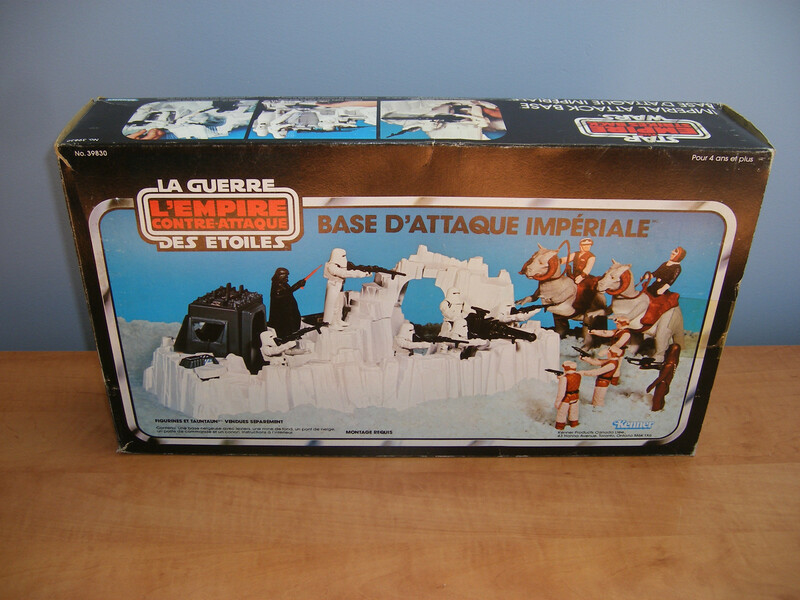 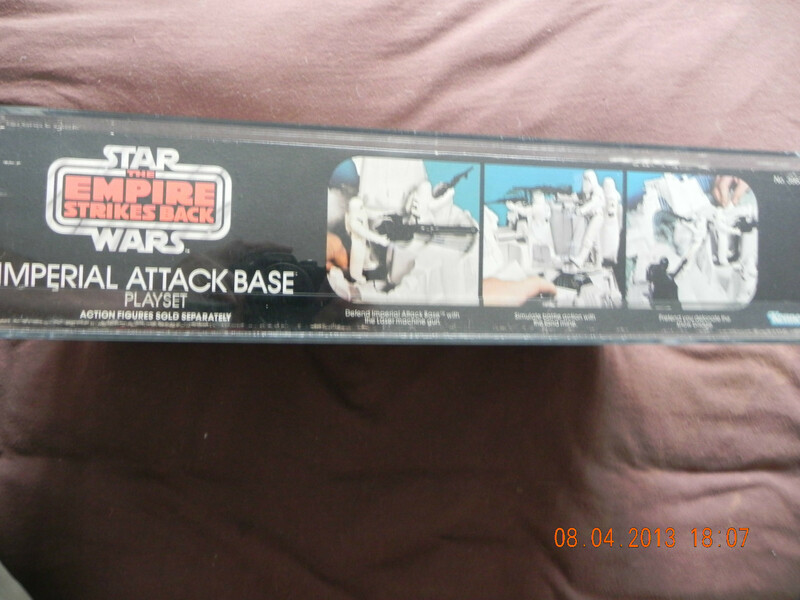 I also had the Imperial Attack Base, so its a natural favorite of mine. 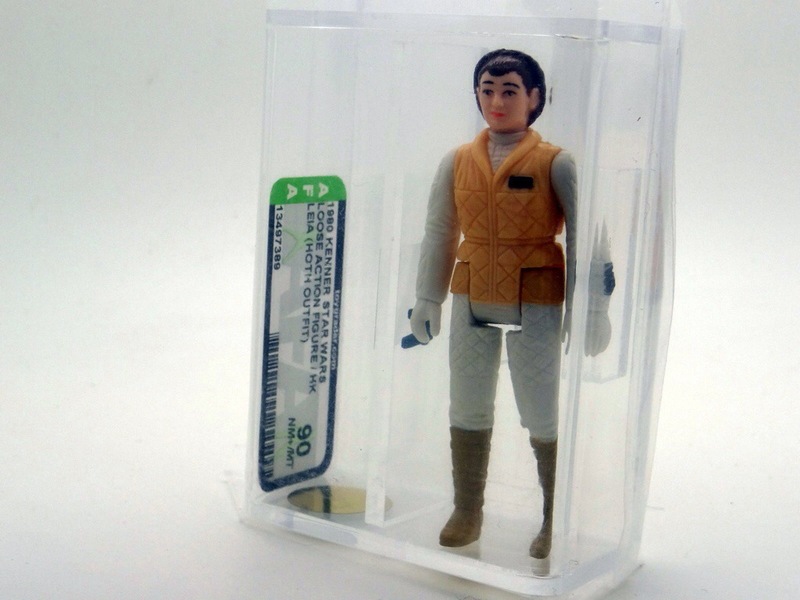 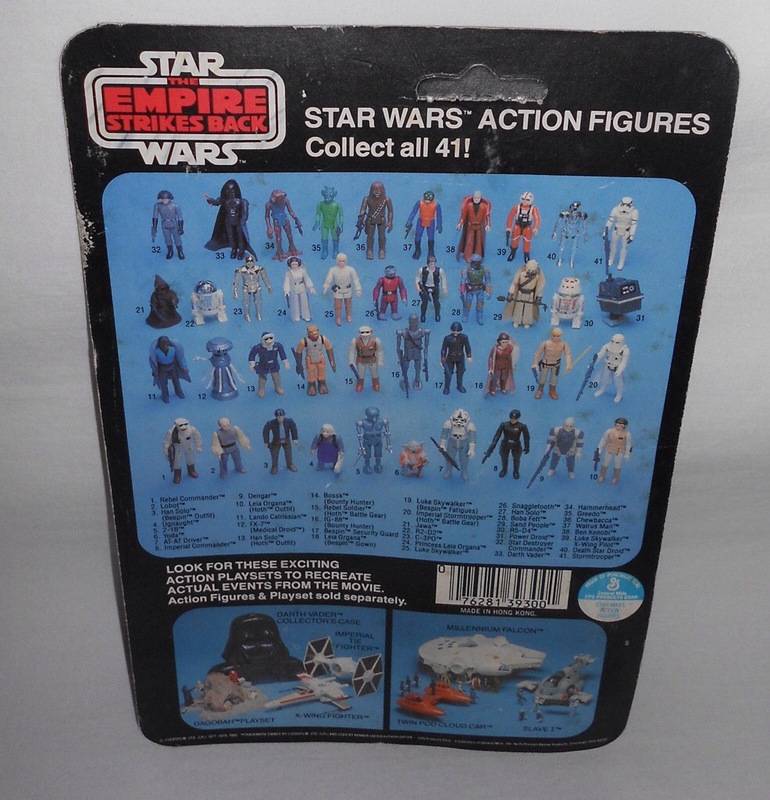 The selection was pretty good, and as Pete and I have been reporting, the market is certainly continues to power, the 31 backs for the “Snowtrooper” attracted some very decent pricing. 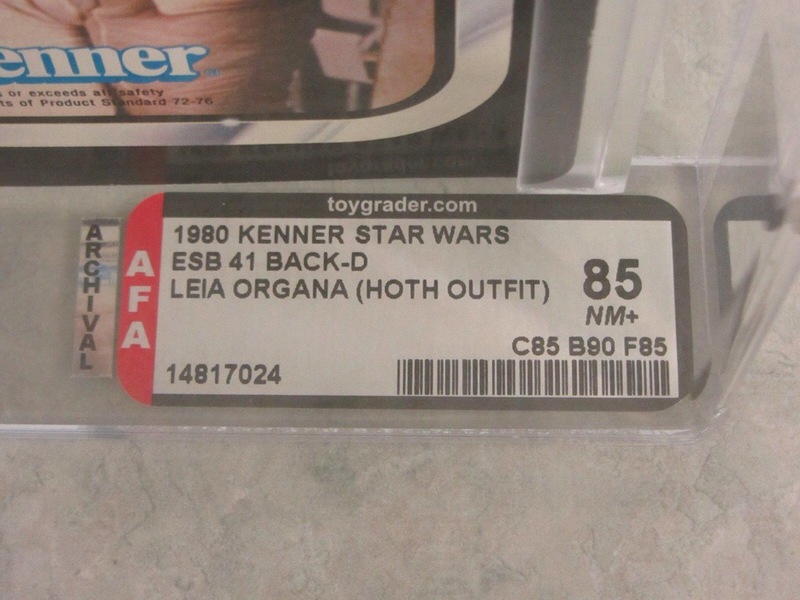 Straight 85’s – always attracts the ‘high rollers’. 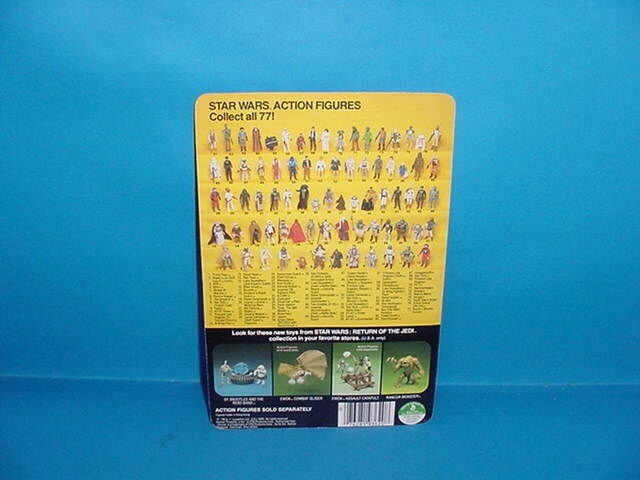 I still wonder if these buyers remain happy with spending so much on one figure. 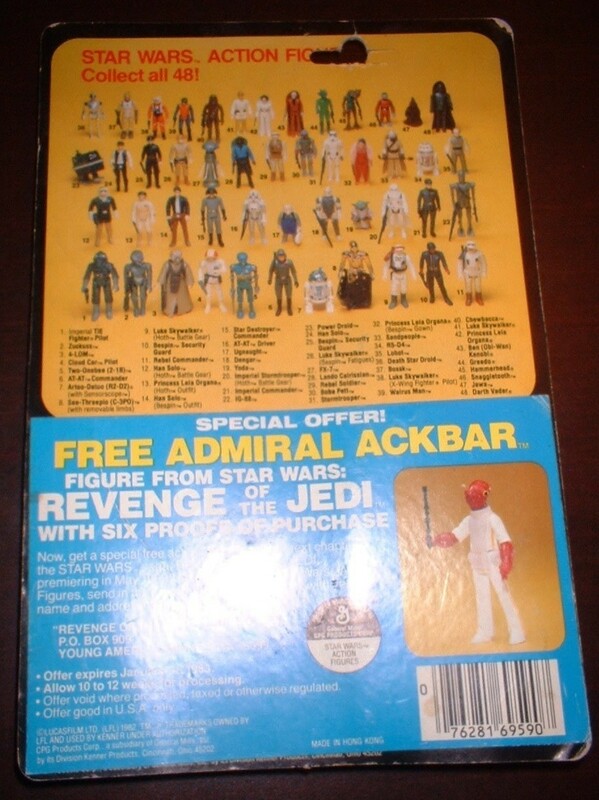 I can only imagine they only buy 85’s or higher, so they really don’t know what they are missing. 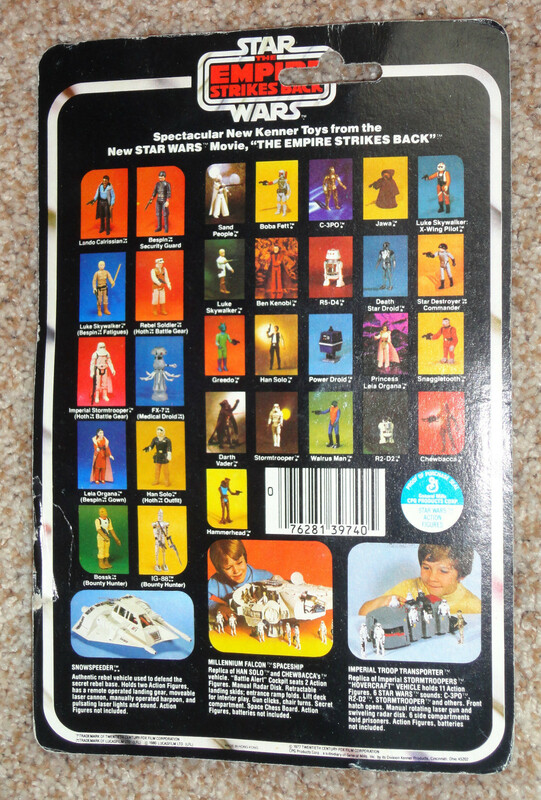 Many 80’s are in great condition, and the 75’s can often be very reasonable condition. 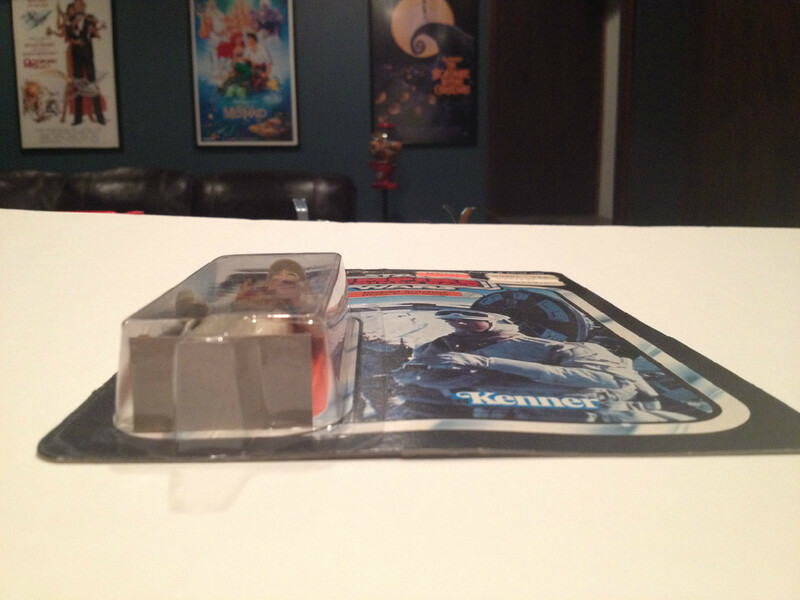 Very nice piece, though I personally wouldn’t be paying that kind of money for a card that has been punched. 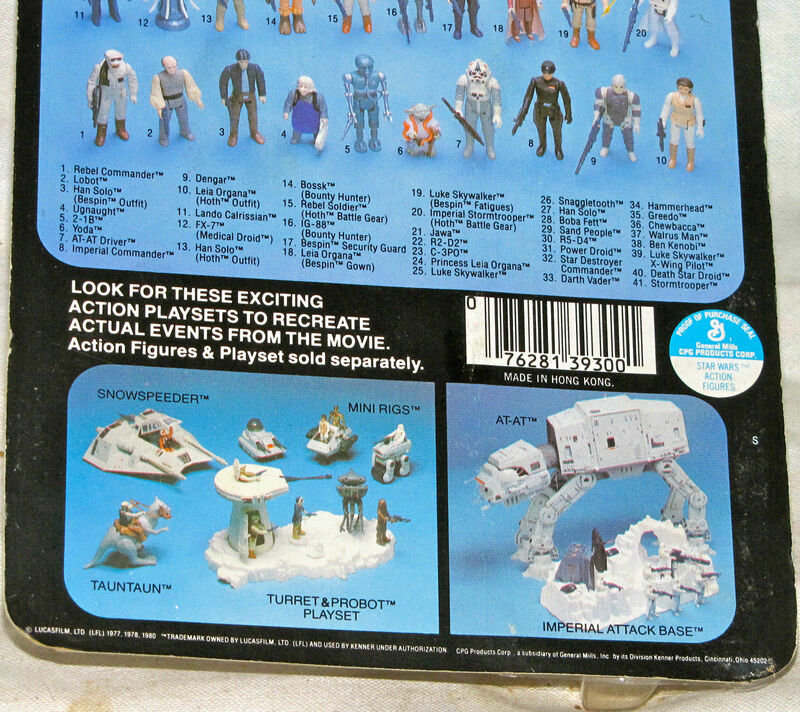 Each to their own though. 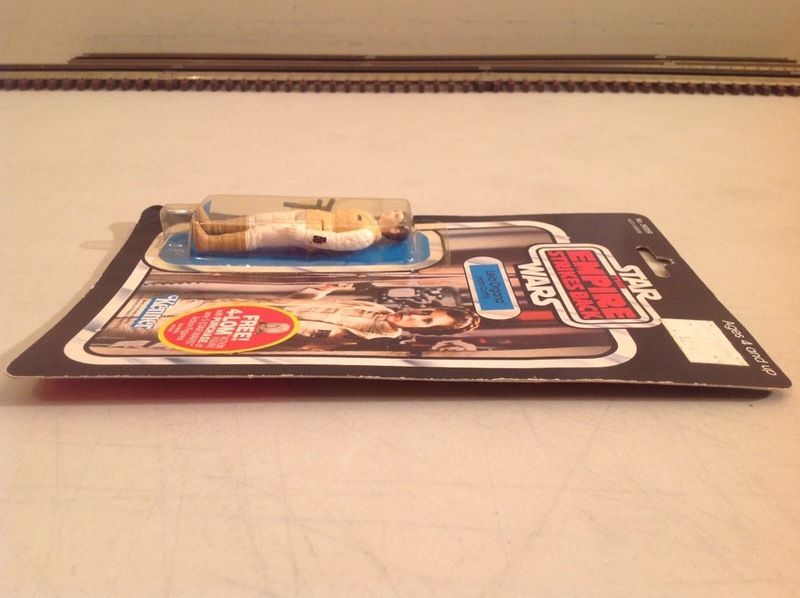 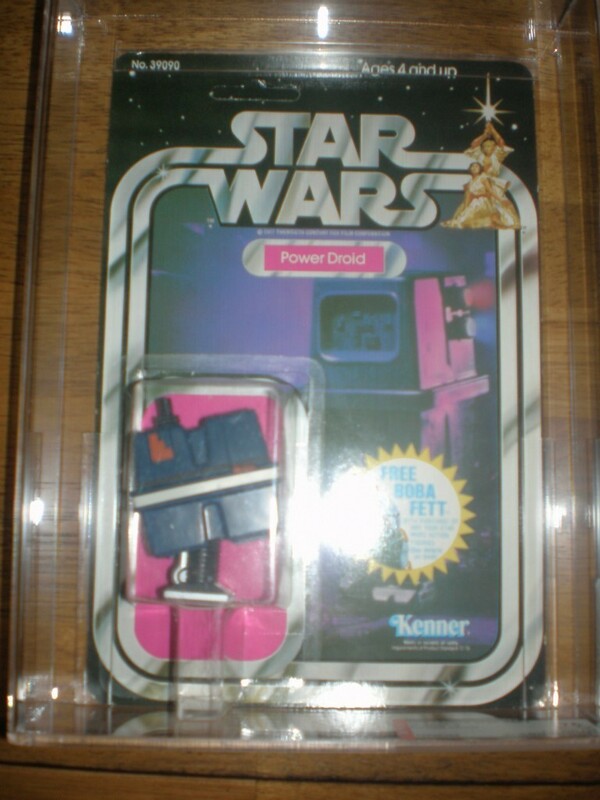 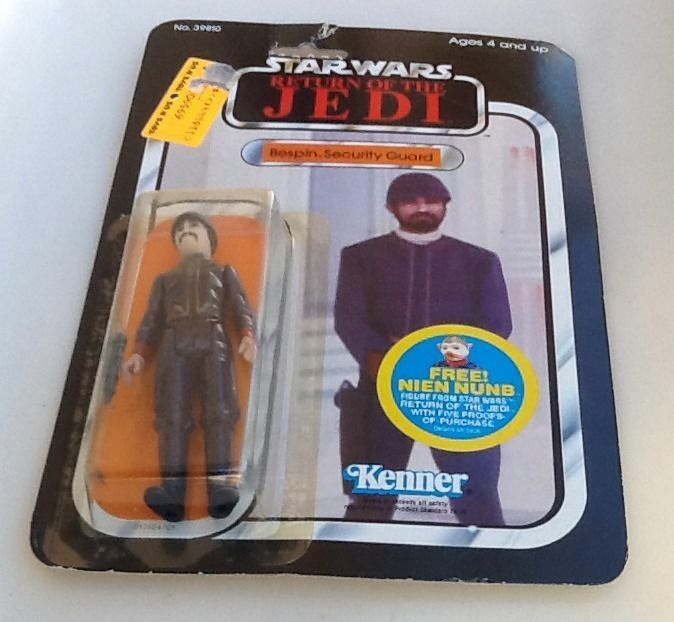 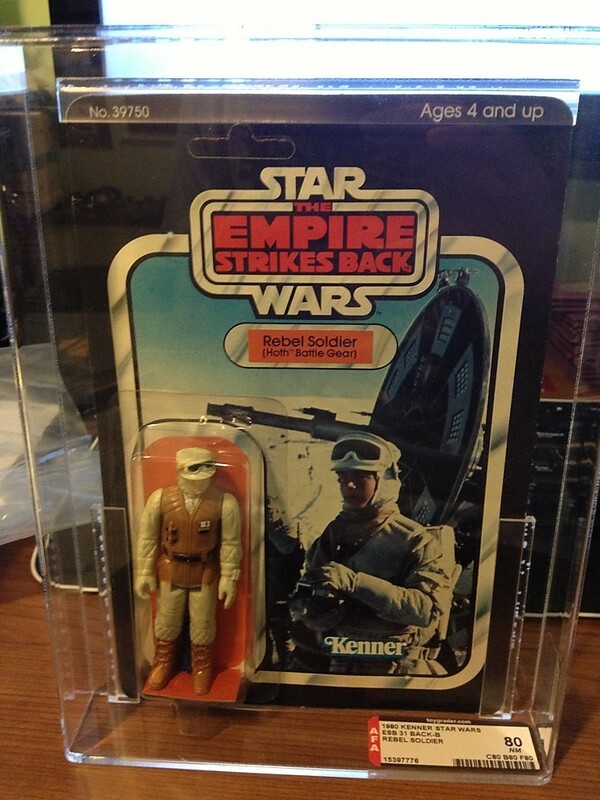 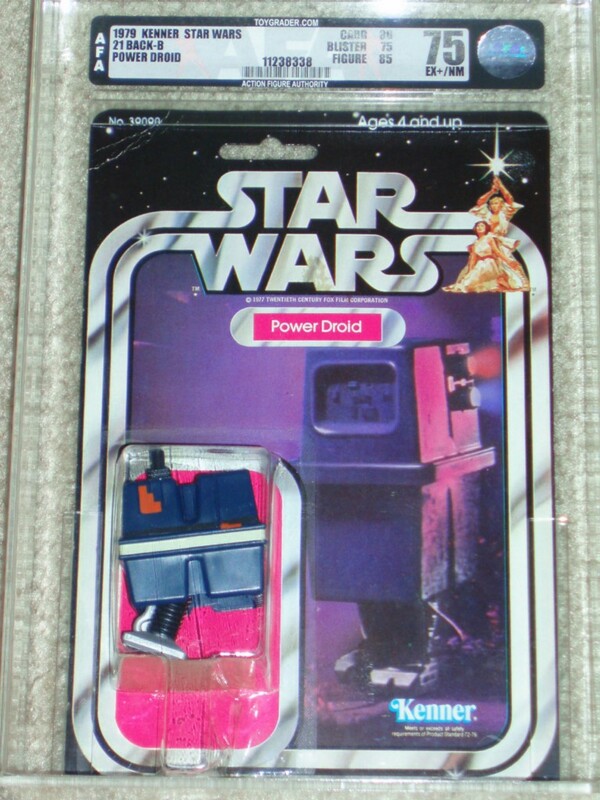 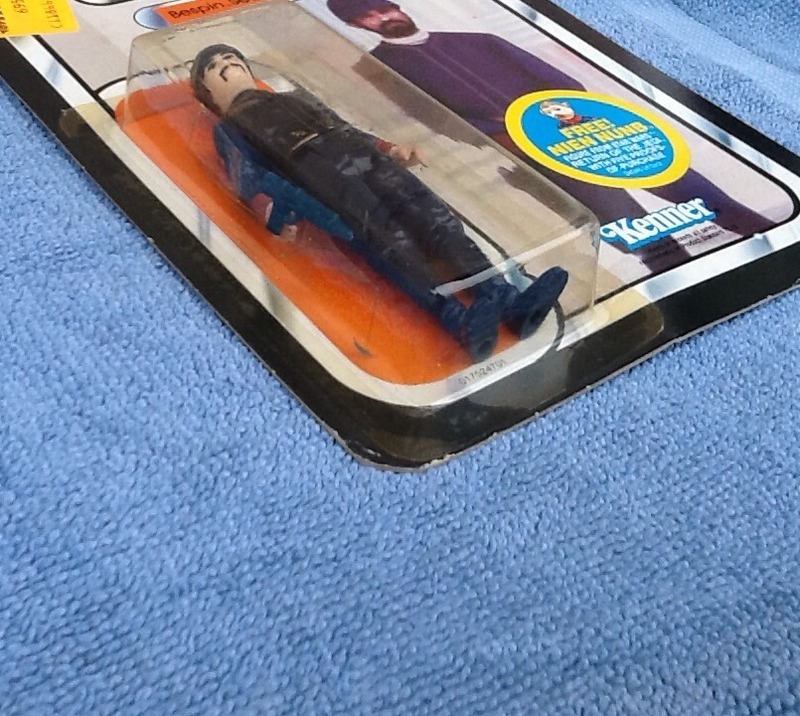 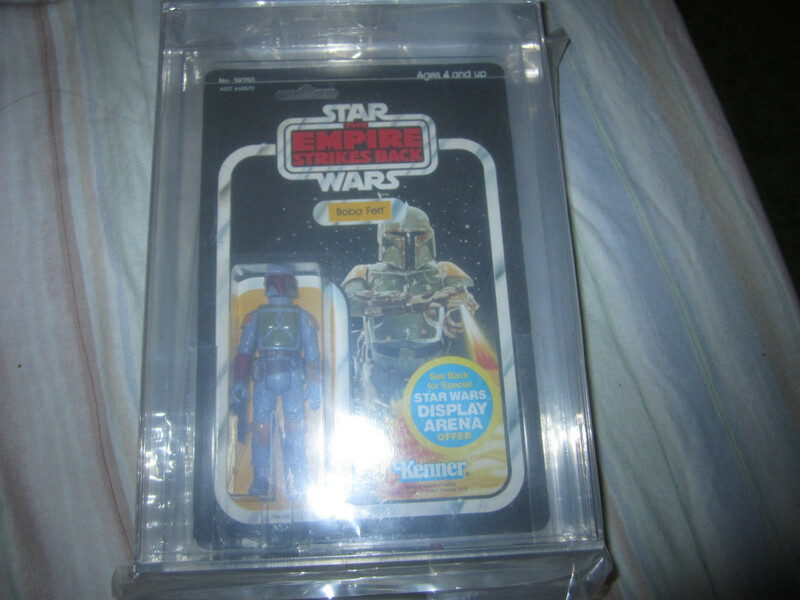 This is an auction listed by Jeff, from Jeff’s Collectibles. 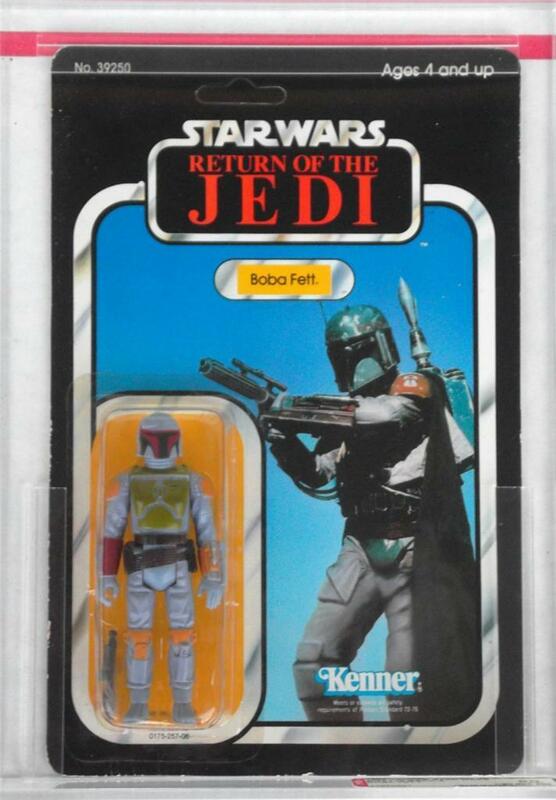 His auctions are great to watch (unless you actually want to buy the item) as he starts them low and almost always gets a solid to high price. 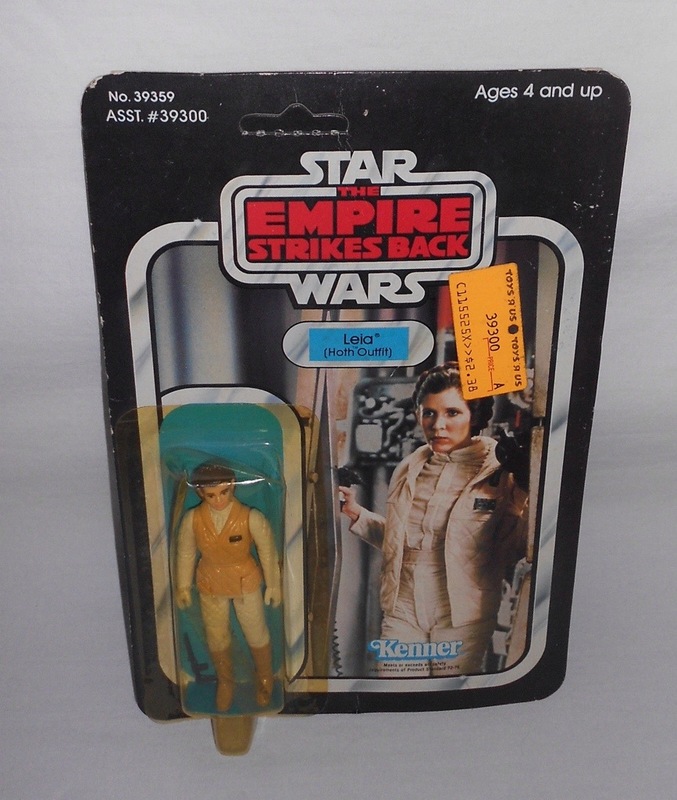 His auction ending times seem to be well timed and the low auction start is a great idea. 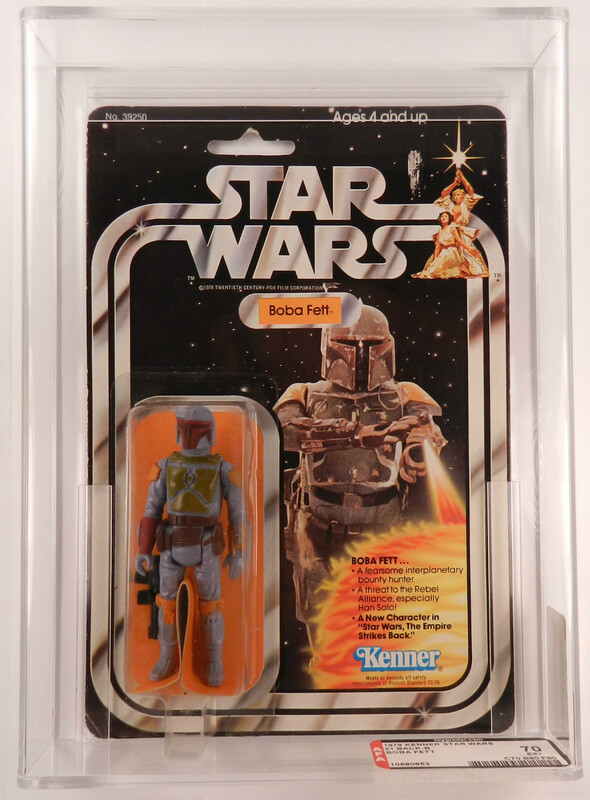 Pete listed some eBay / selling thoughts a few months ago – anyway serious about selling MOC’s / AFA items really should watch how Jeff does it. 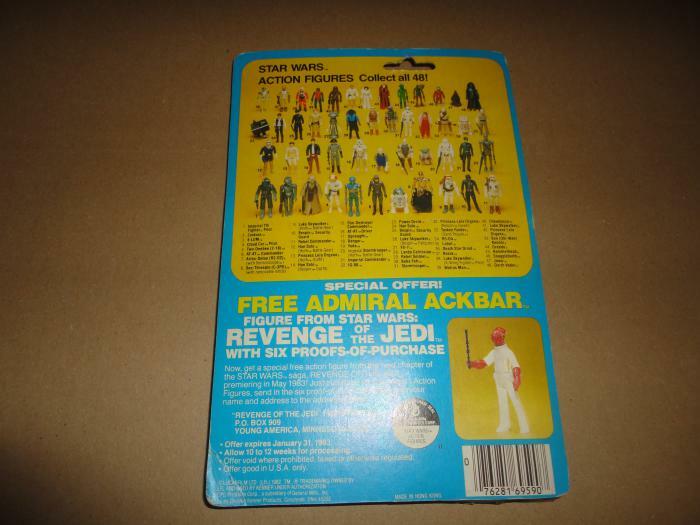 And his shipping / packing is second to none. 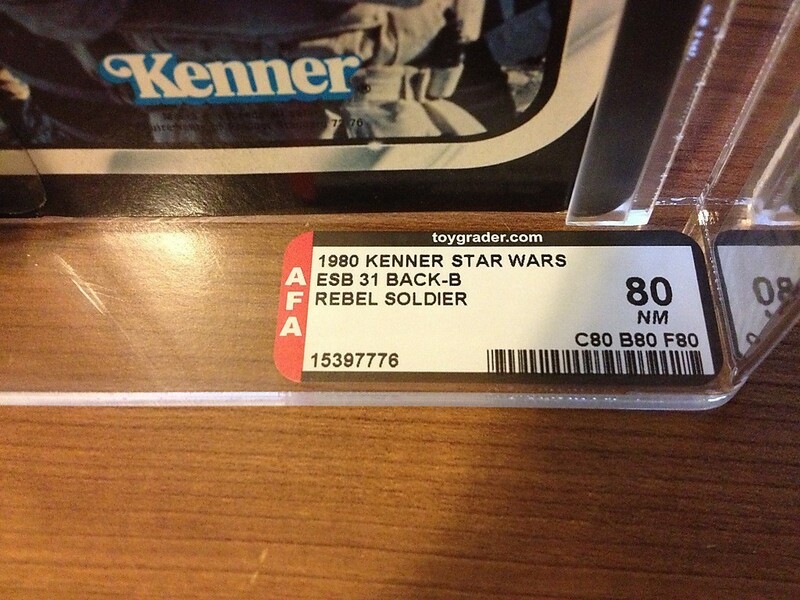 The back of the card has a tear, but compared to the high prices of the graded versions, this was a steal. 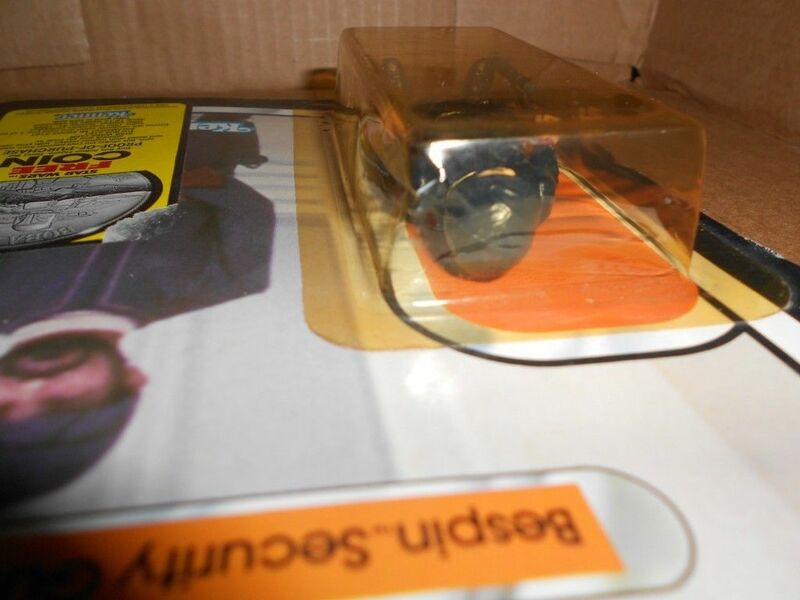 The auction lasted 15 minutes as a BIN – the seller left a few dollars on the table. 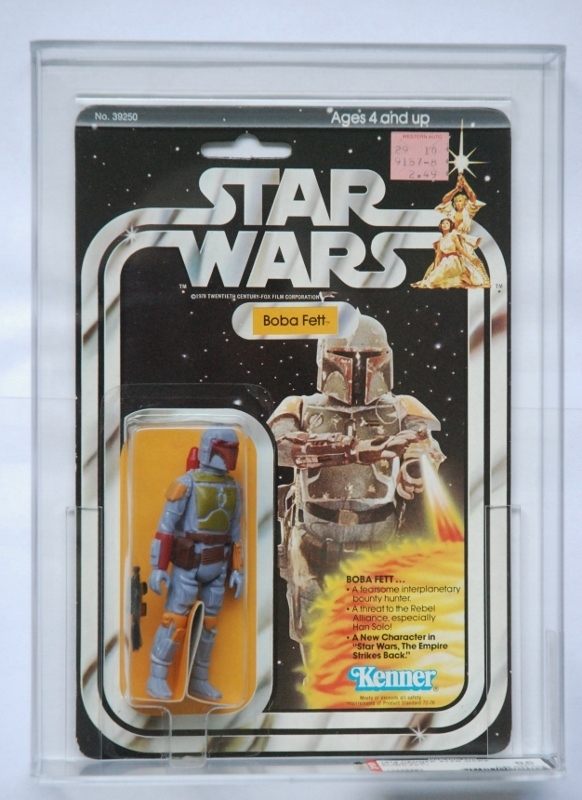 Again, best to run auctions starting at 99c, I’m sure he would have got more than $80. 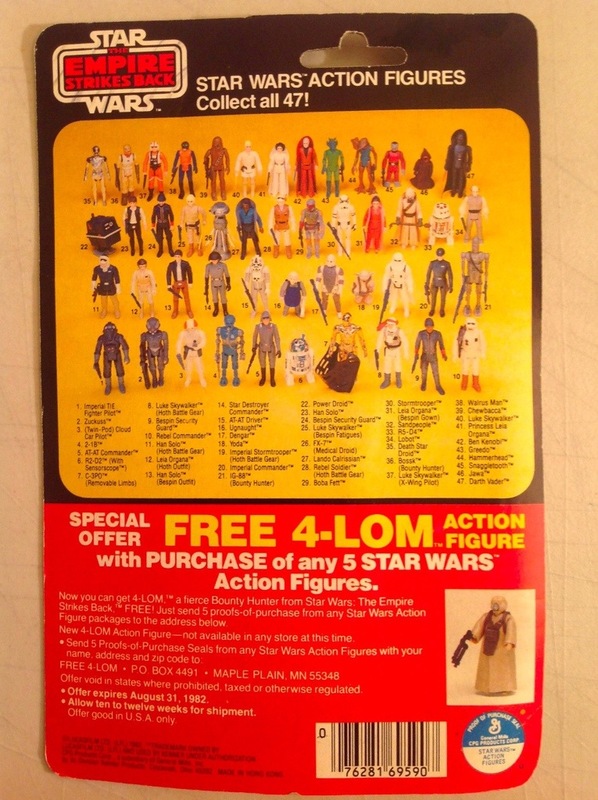 So in summary I’d say there has been a fair inflation of this item in the past few months. 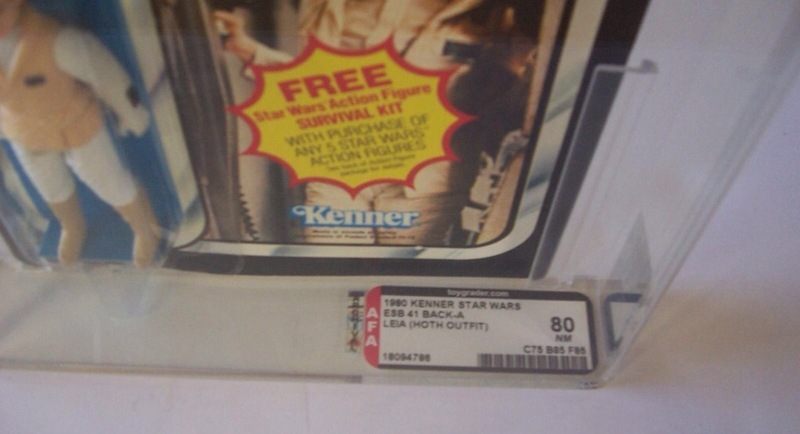 Whilst I don’t have specific data, apart from my own 31A (AFA80) that I purchased back in 2006 for $200, these prices are well above what we would have seen a year ago. 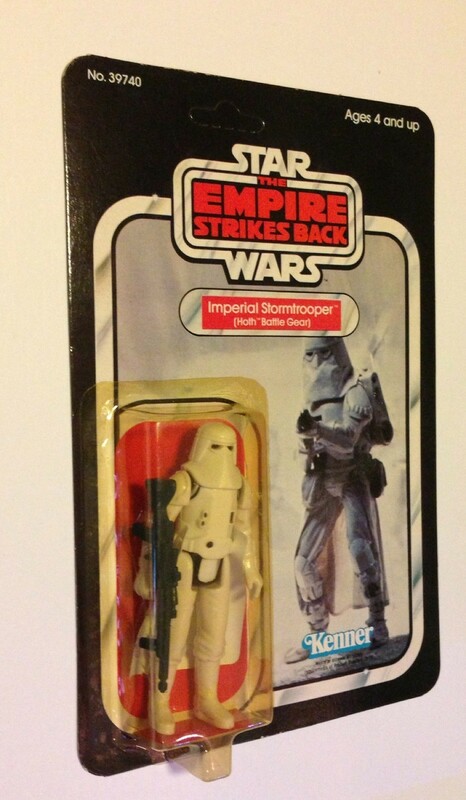 Whilst not specifically Imperial Snowtrooper items I have added in a few items where the figure gets a run in the packaging. 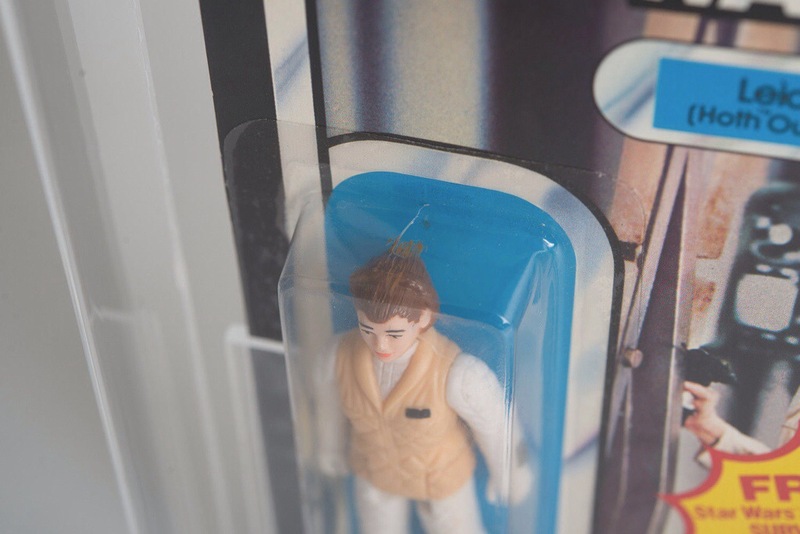 I’m sure the multiple instances of the figure on multiple playsets / vehicles resulted in a lot of multiple purchases of the figure. 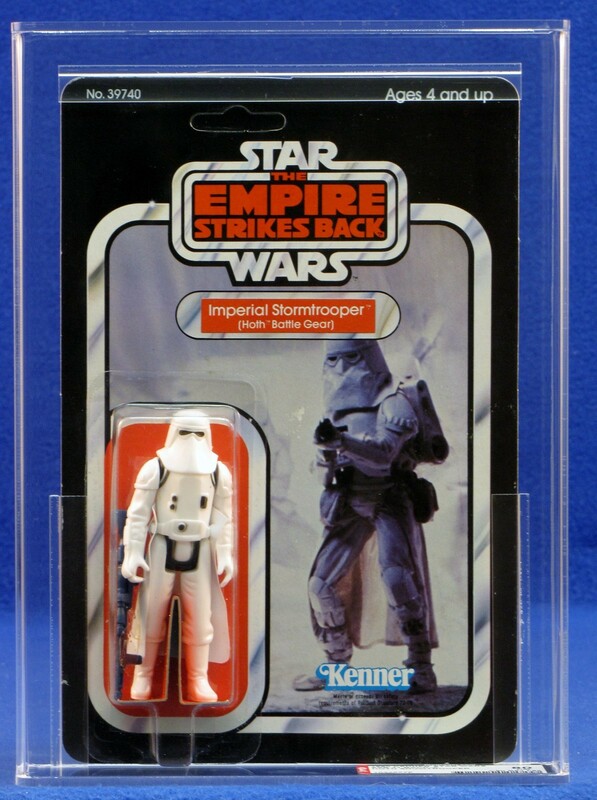 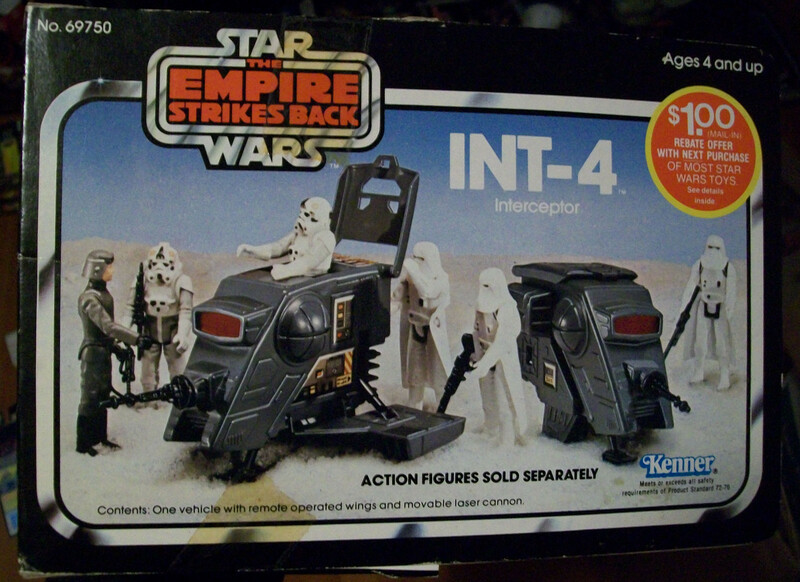 As I kid aI had quite a few Imperial Snowtroopers, but only one Stormtrooper, I’m sure this was linked to the fact I had the IMperial Attack Base and I “needed” to have multiple instances of the figures. 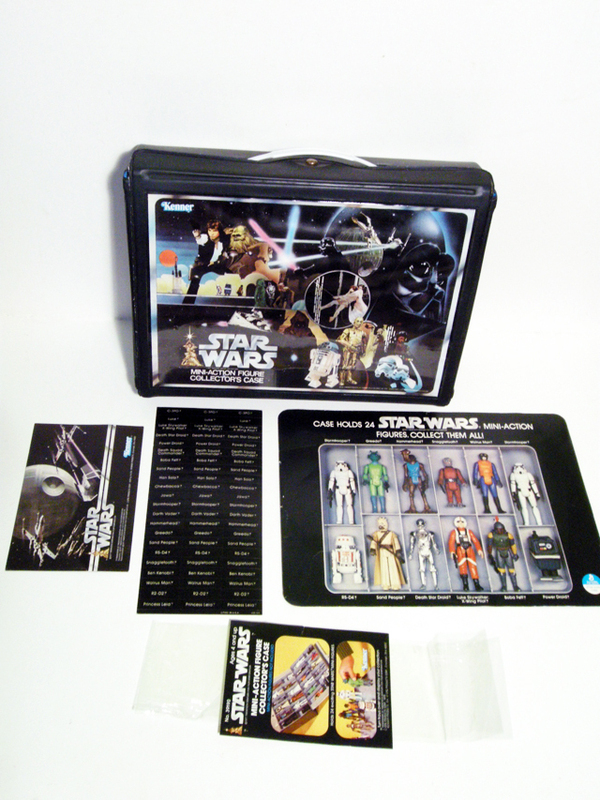 The box is in great condition, its not that easy to find these without the front flap having been folded. 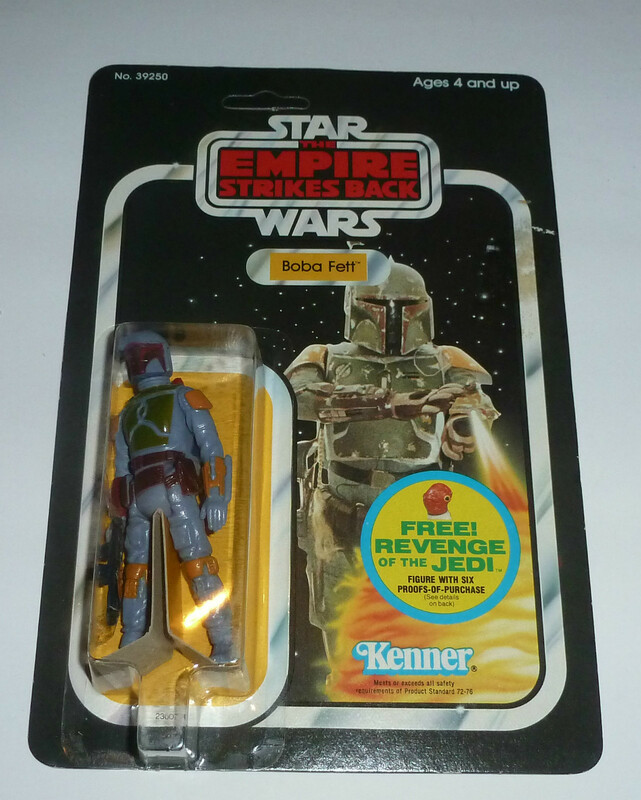 The rebate offer is also a nice addition to the pack and helps push the price up a few $$. 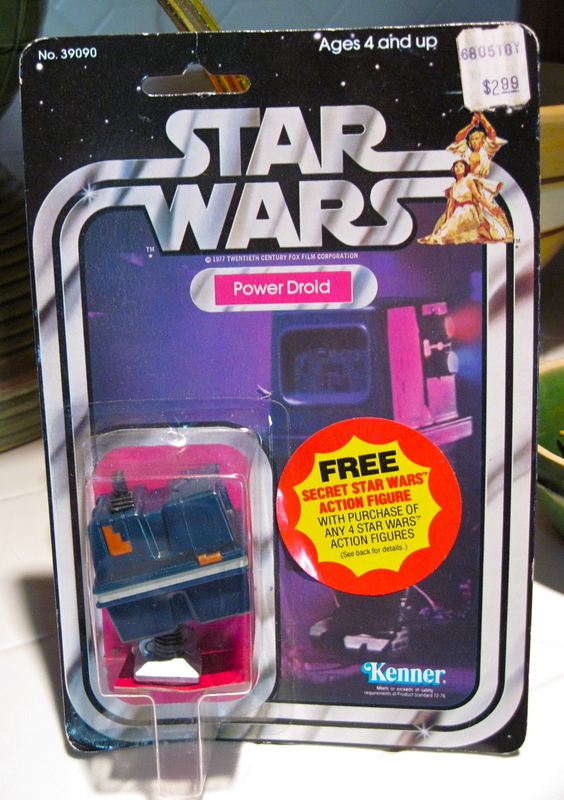 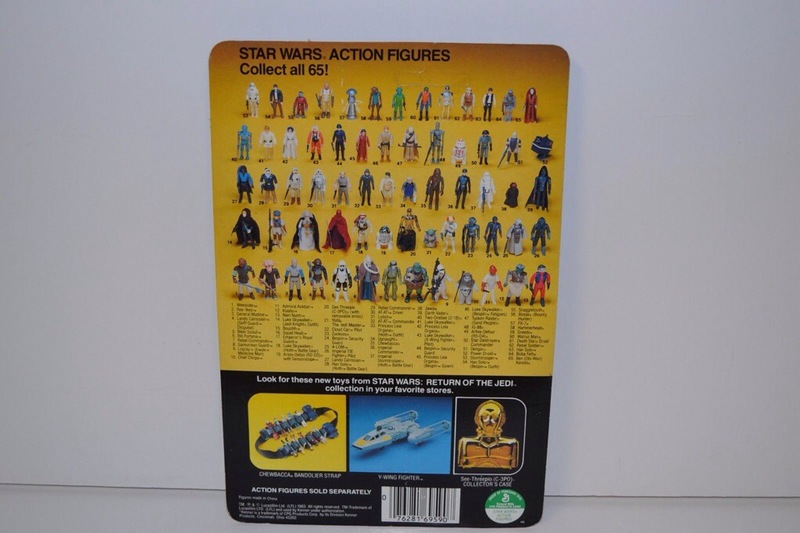 I’ve been collecting Star Wars vintage for about the last 8 years, if you discount the late 70’s – mid 80’s when Star Wars figures were bought for playing with. 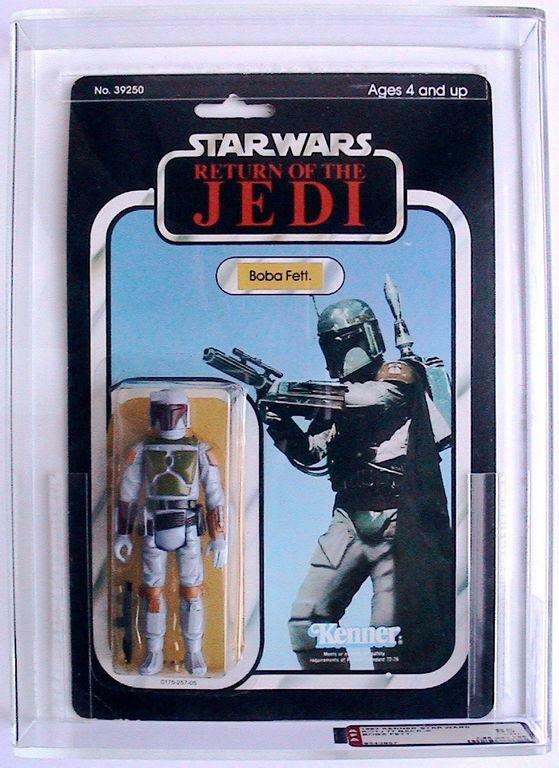 In my recent collecting time I am yet to purchase a Boba Fett MOC. 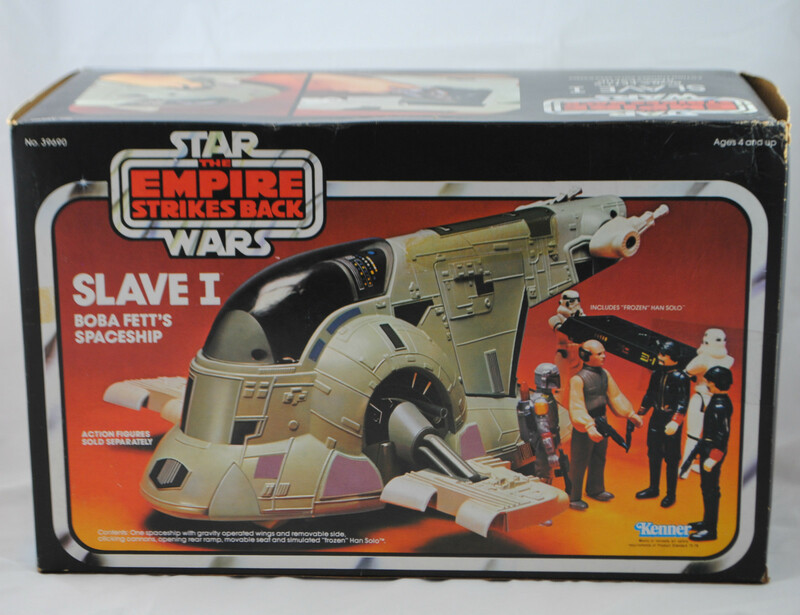 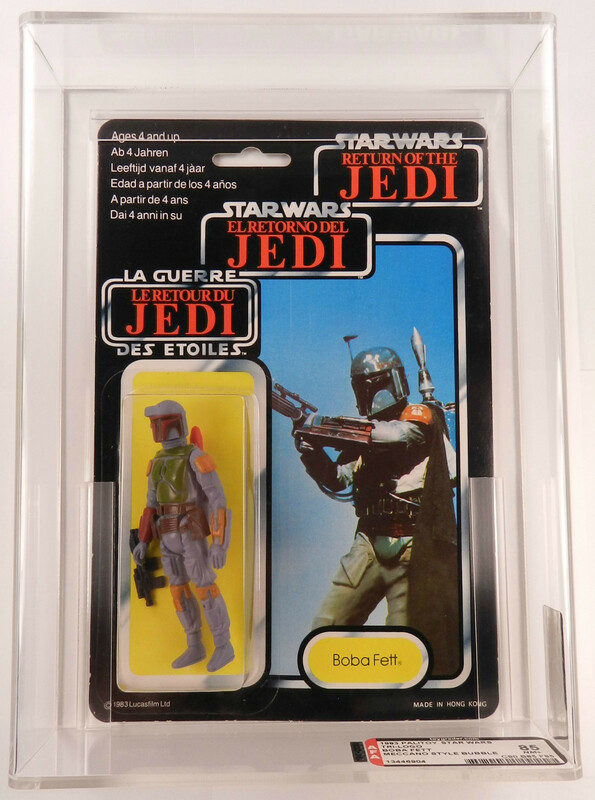 Its somewhat of a grail – though to be honest I’ve always regarded them as too pricey and not bought a Boba Fett MOC on principle. 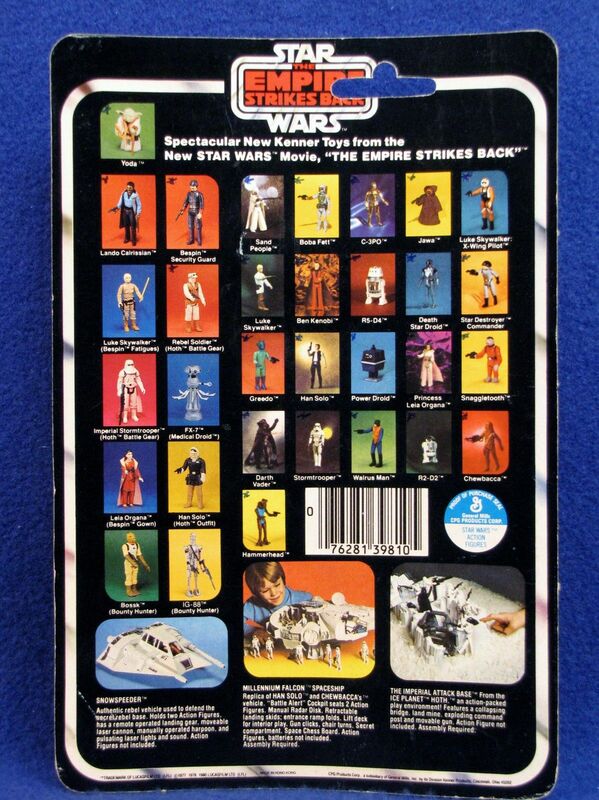 Though to be honest I totally see why he’s so popular and either card back image is great, and I really would love to add one to my collection some day. 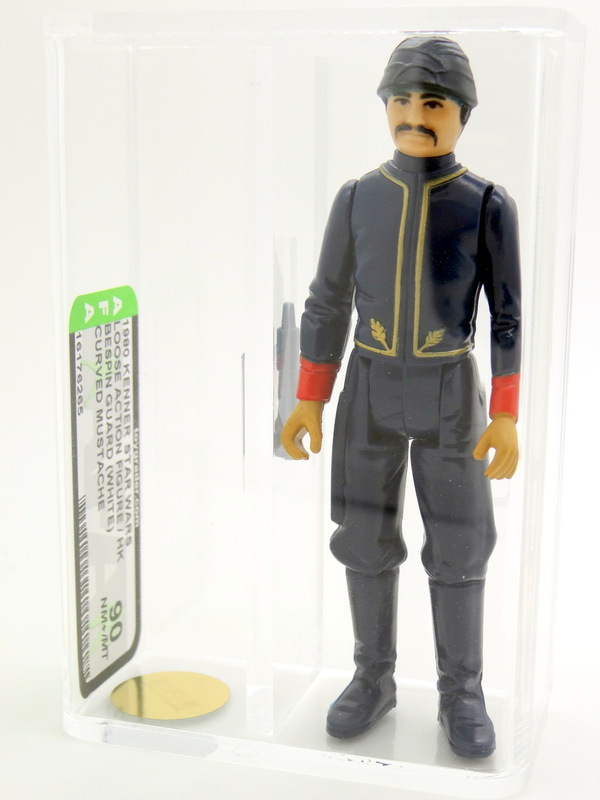 Over the past few months when I’ve compiled the “figure of the month” sales I’ve been surprised that some of the figures have had the volume of sales to warrant a decent post. 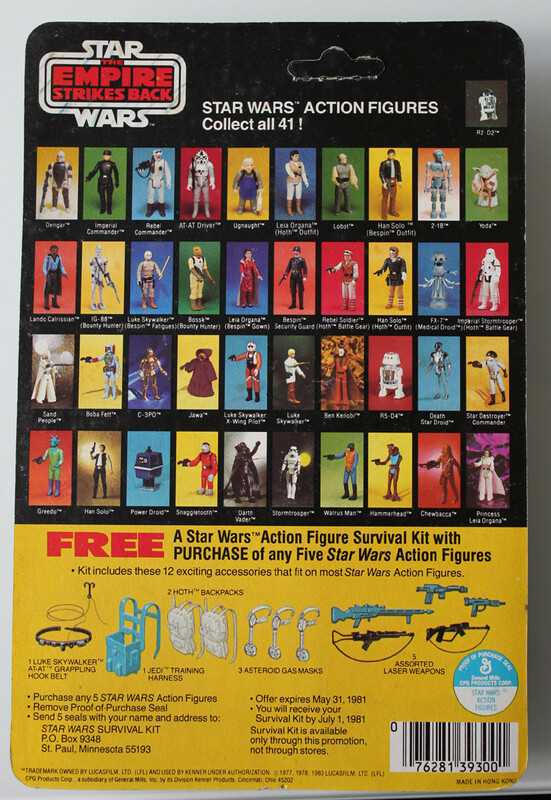 But they always have. 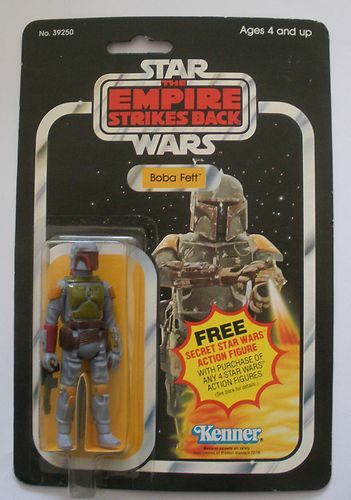 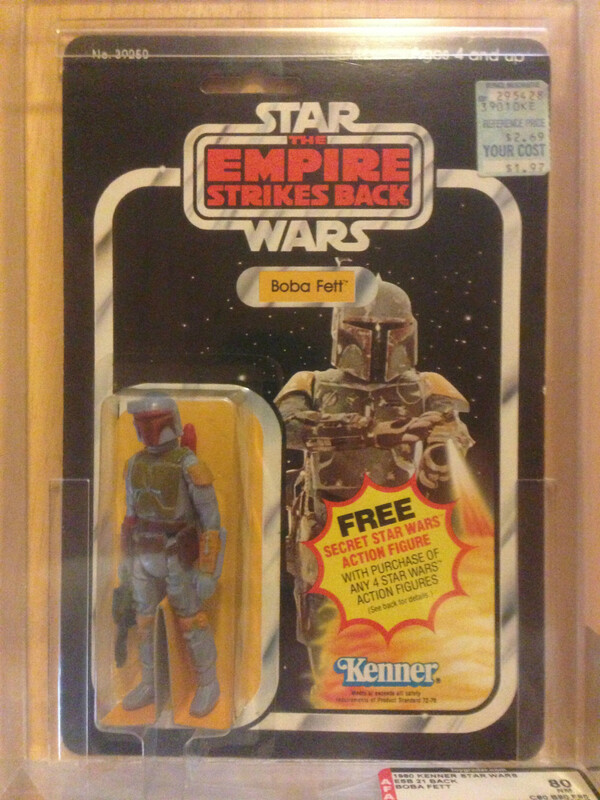 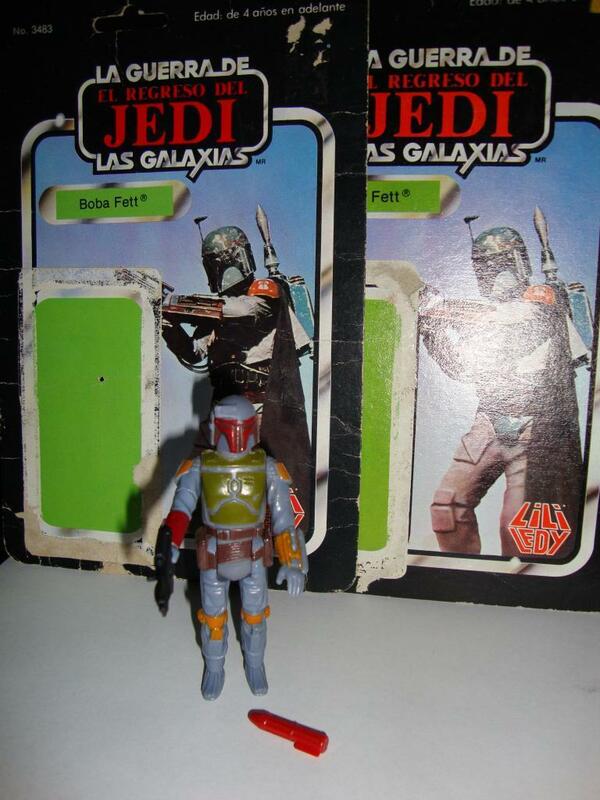 I knew Boba Fett would be different – and yep I had to limit the amount of figures I included in the post. 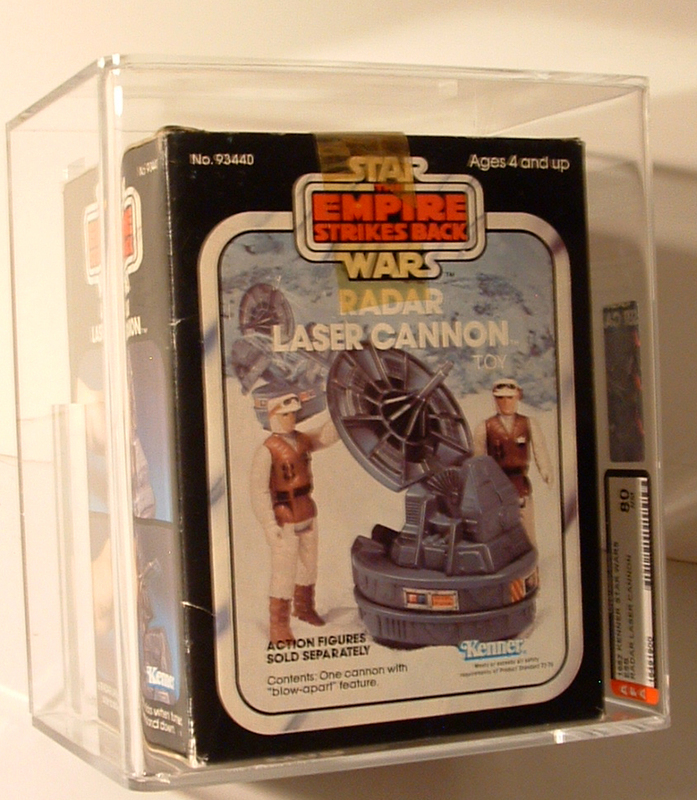 eBay was filled with plenty of examples, including some really high end pieces – not least of all a $20k rocket firing prototype (see here for a synopsis from Pete). 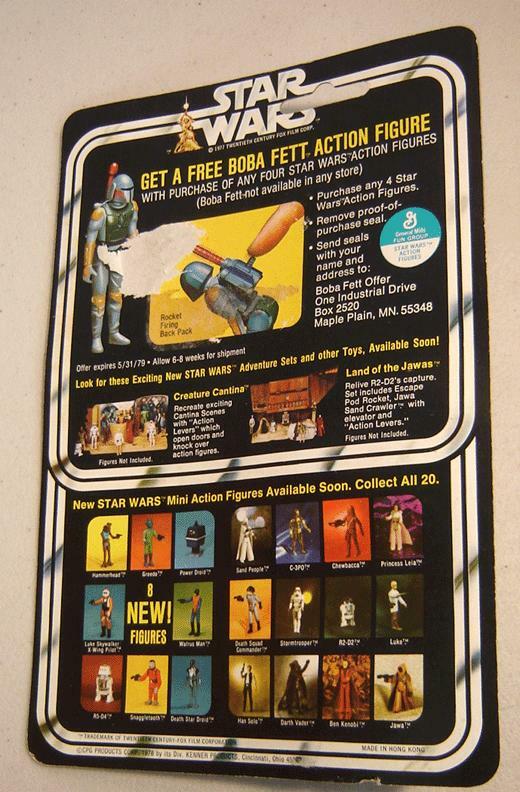 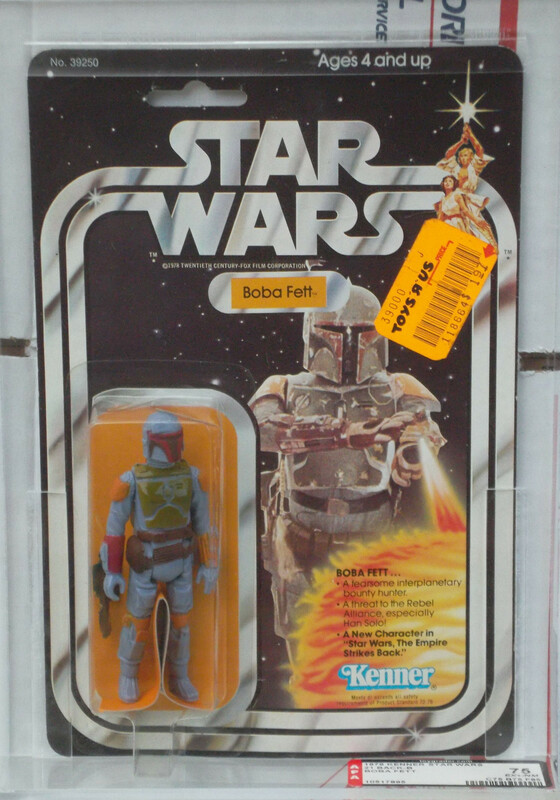 As expected the prices were high, and you’d think with the quantity of items prices could be a little less, but it shows the demand that exists for Boba Fett. 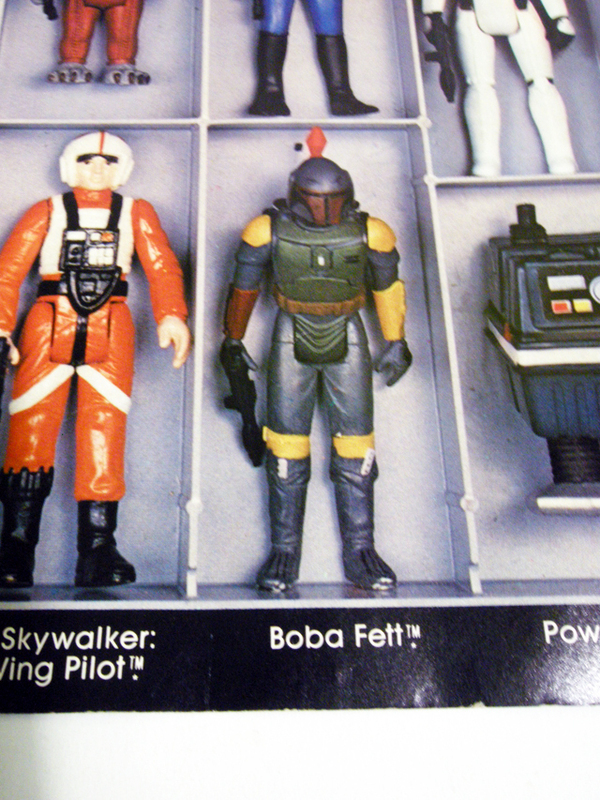 Got to love the card front – which even included a brief description of Boba. 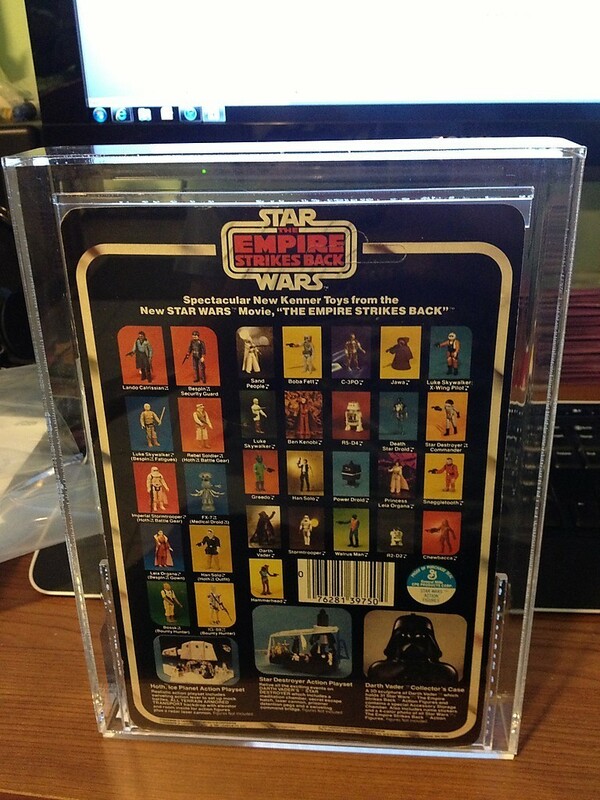 I found three 20B cardbacks graded 85, 75 & 70. 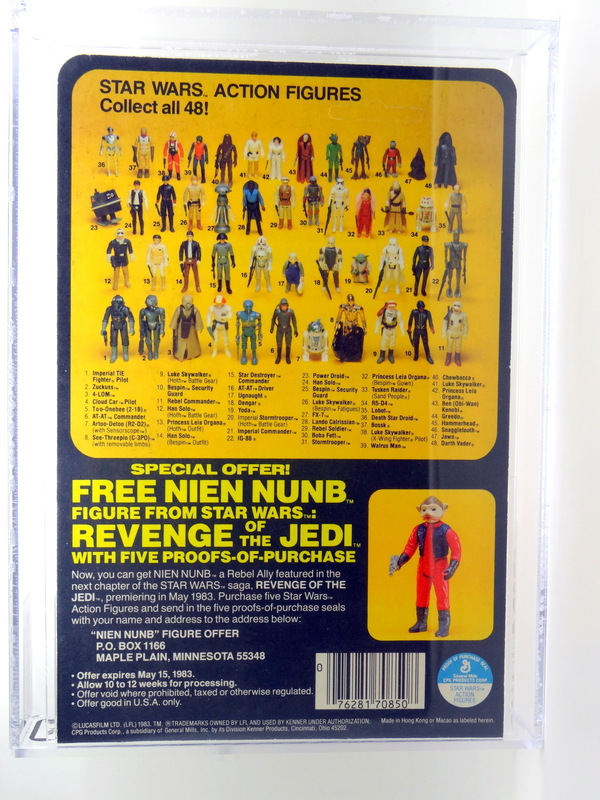 It’s always staggering to see the price differential between a straight 85 and then 75 and/or 70. 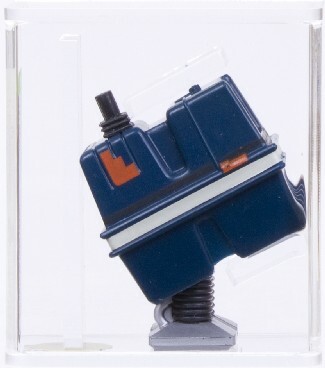 The AFA70 looks like great value relative to the AFA85. 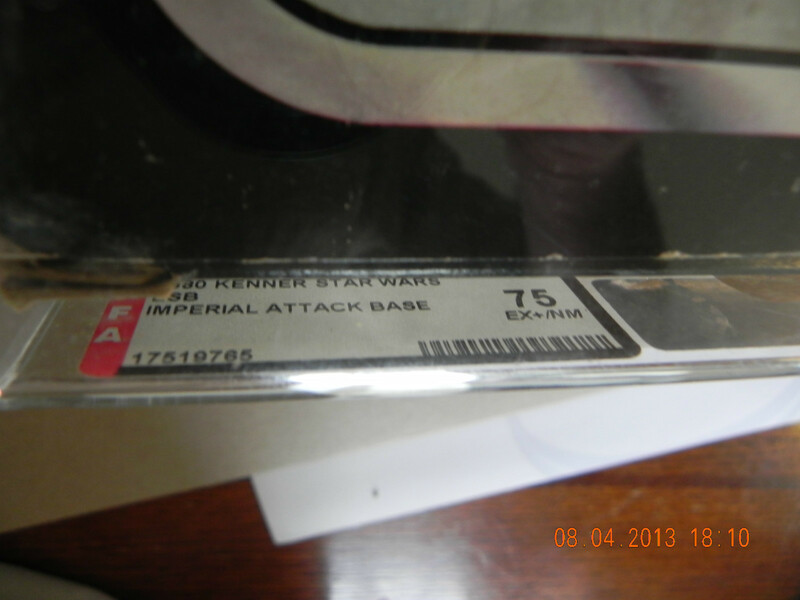 In fact relative to the AFA75 it is great value also. 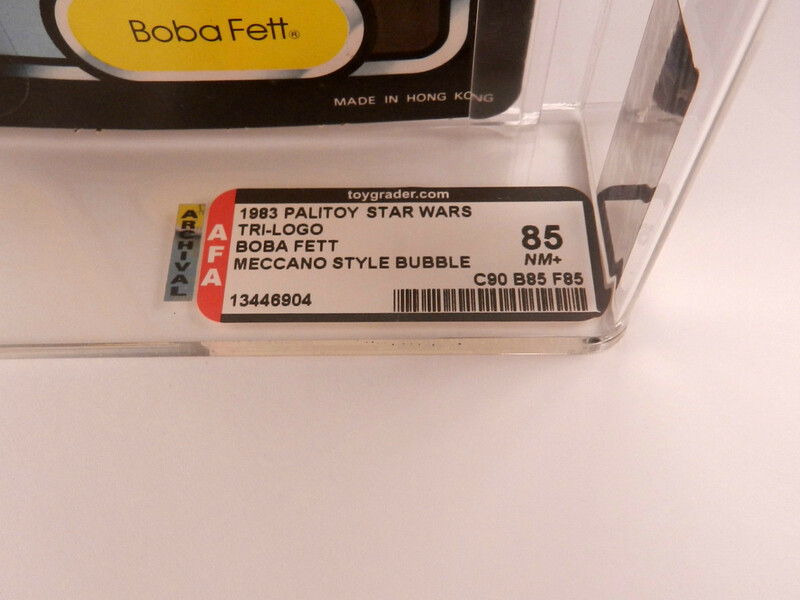 I’d rather have that small price sticker tear on the AFA70 as compared to the TrU fluorescent orange price sticker (they really are hideous those TrU stickers!). 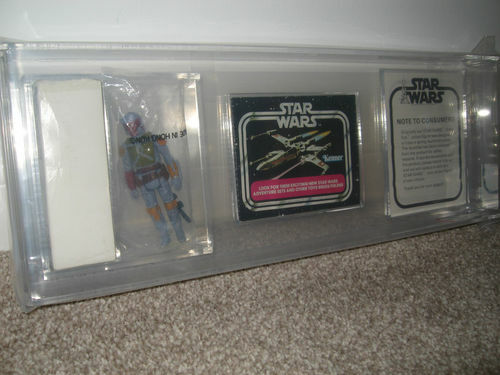 This was a good trio of pieces to highlight how grading can really impact the overall price. 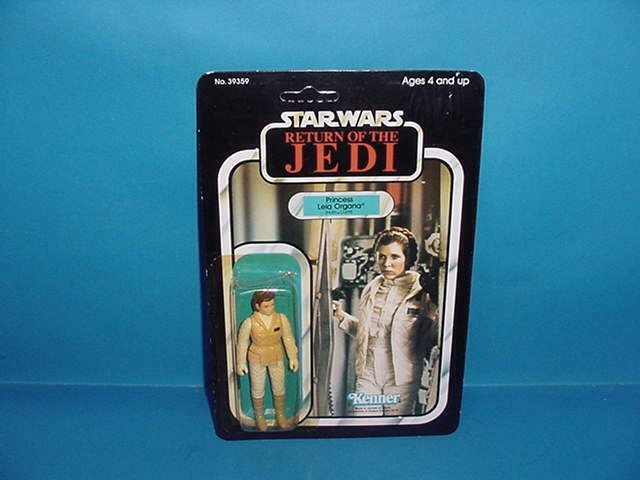 The description states that the bubble has lifted and partially (25%) re-sealed. 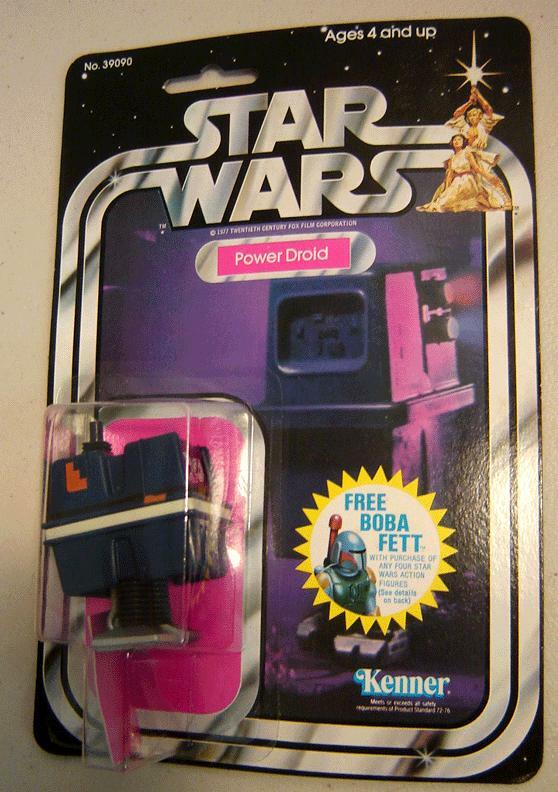 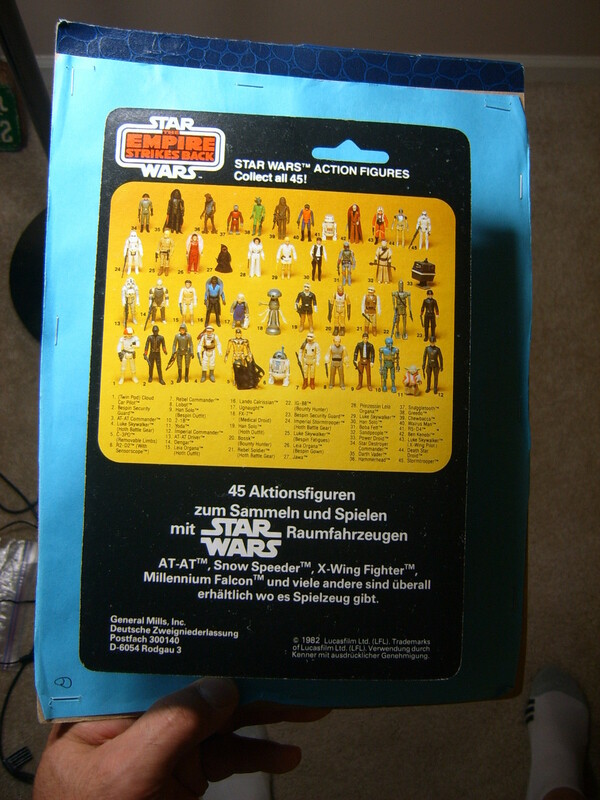 Unlike the Star Wars card the AFA80 was actually cheaper than the AFA75 I found – though I’ll assume it was the price tag on the AFA80 that drove the difference. 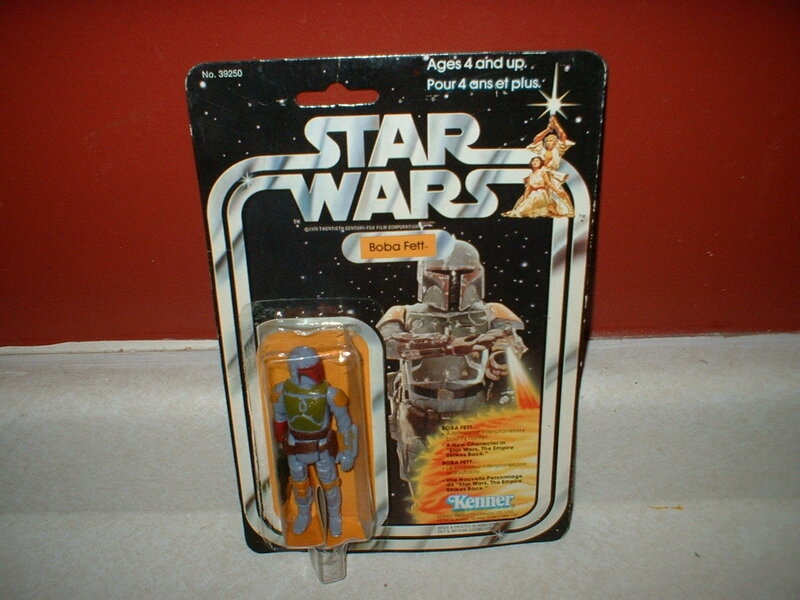 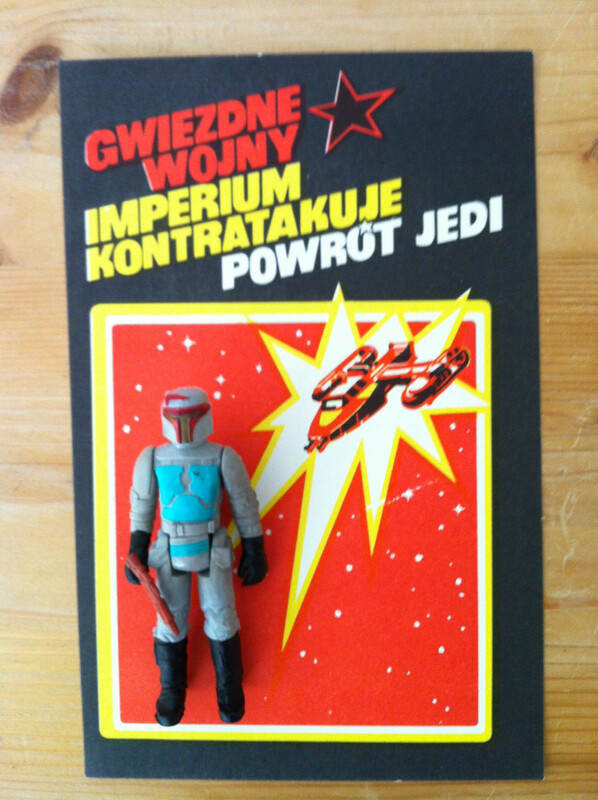 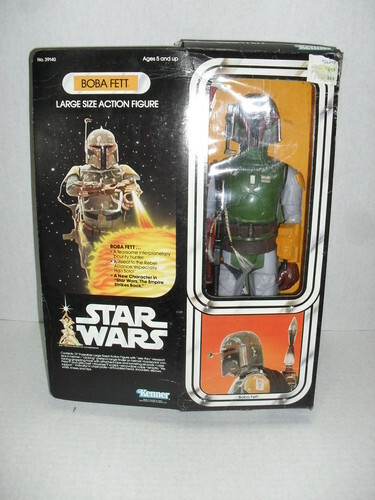 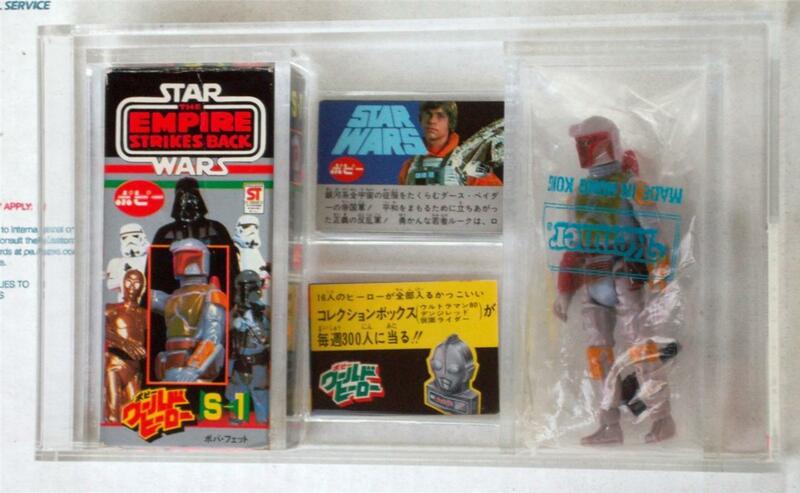 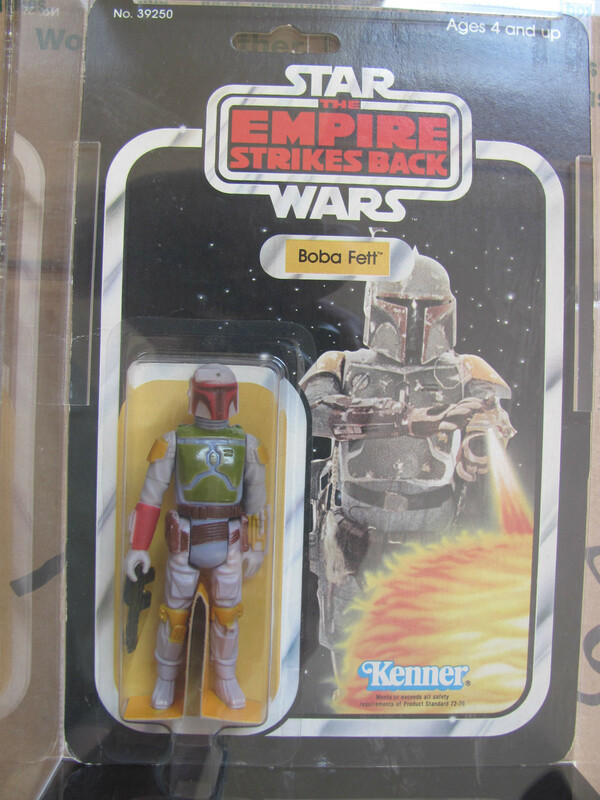 There was plenty of foreign Boba Fett items to choose from, here’s my selection…. 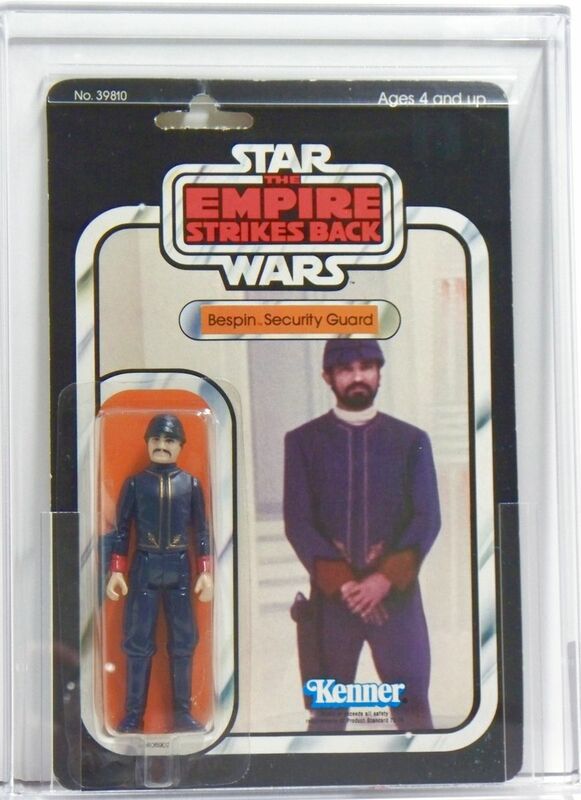 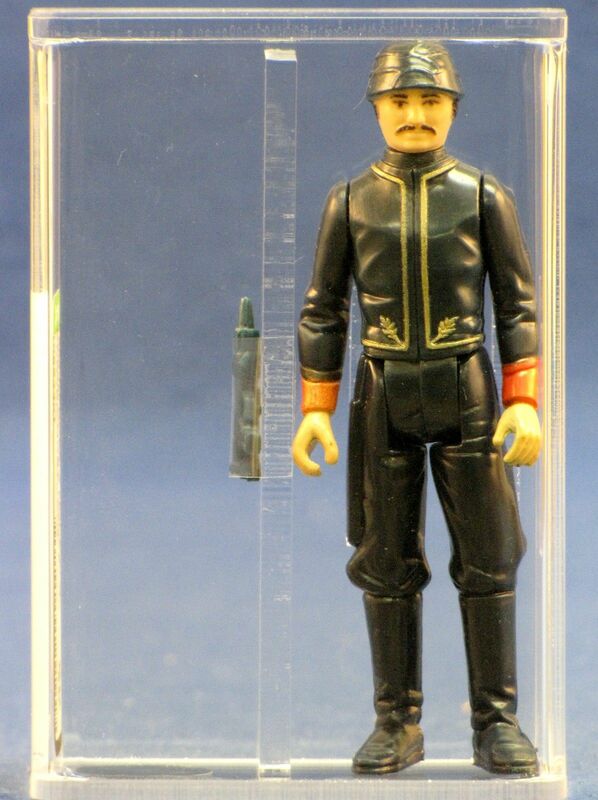 On an initial glance you ask yourself “why did they make this figure?”. 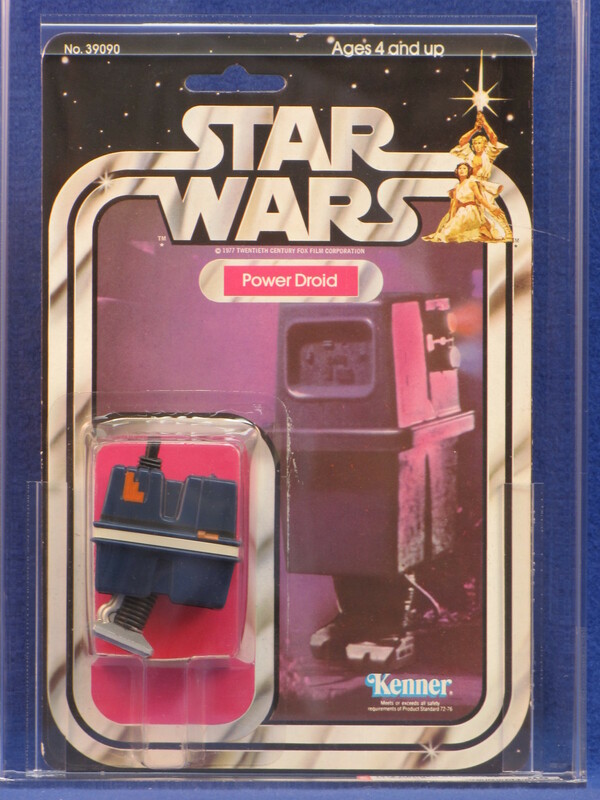 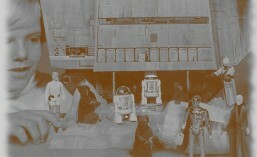 But then you remember it was the 70’s – robots seemed pretty futuristic and I imagine adding droids to the collection helped give Star Wars that sci-fi feel. 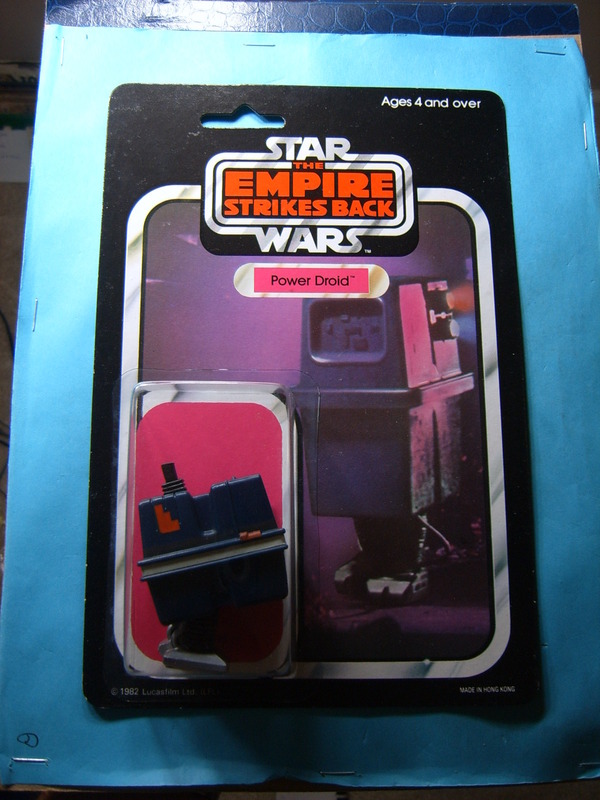 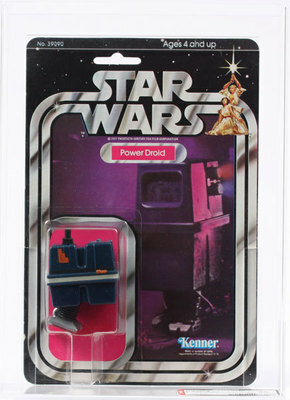 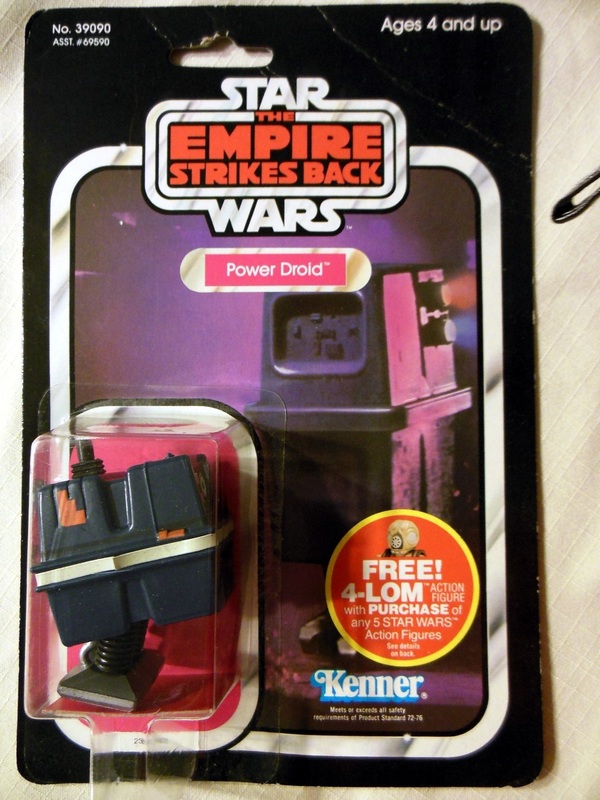 Then you actually play with this little guy and realise how neat he is, especially the “click click” (or “gonk gonk”). 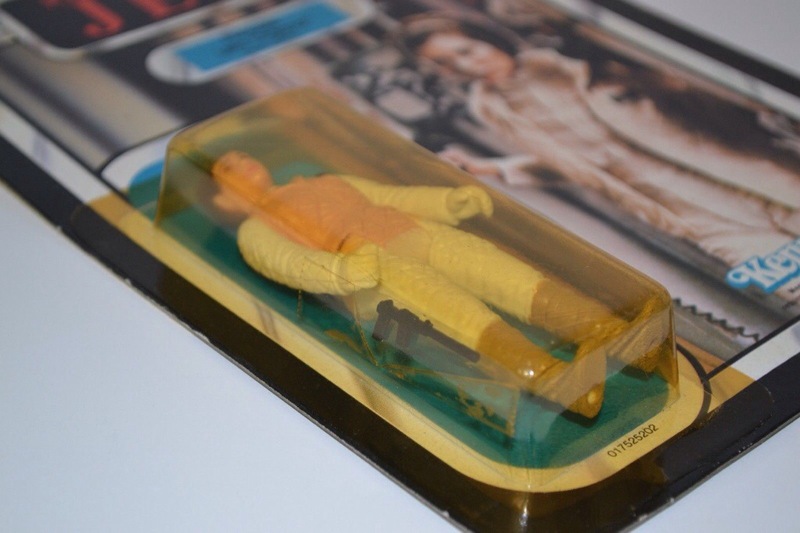 He actually appeared in all three Original Trilogy films – popping up in places such as the Sandcrawler, Death Star, Echo Base & even Jabba’s dungeon (being tortured no less !!). 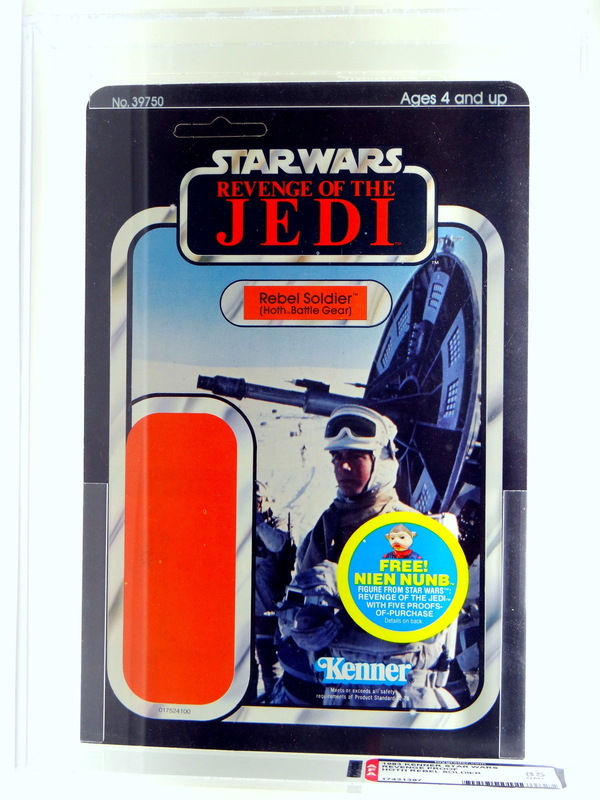 He must be a popular figure as there were a high level of sales this month – and a great range across all three movie cardbacks and of course plenty of AFA items …. 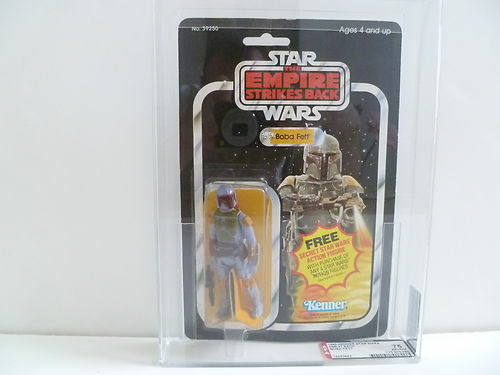 I’m assuming this was the 20D (which had a black sticker covering the Boba Fett offer on the back) however looks like the sticker was peeled off and took a bit of the cardboard with it. 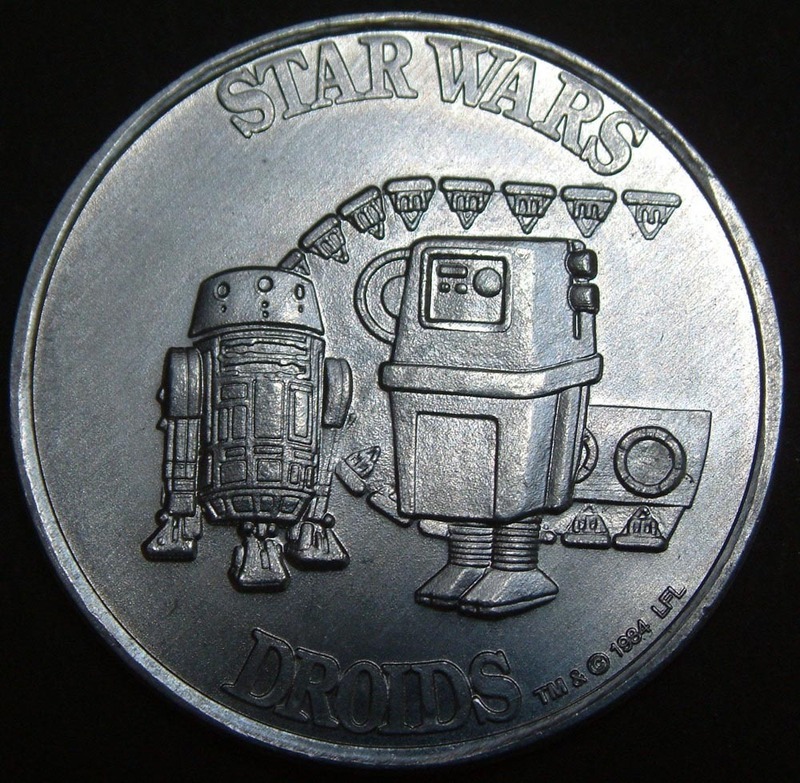 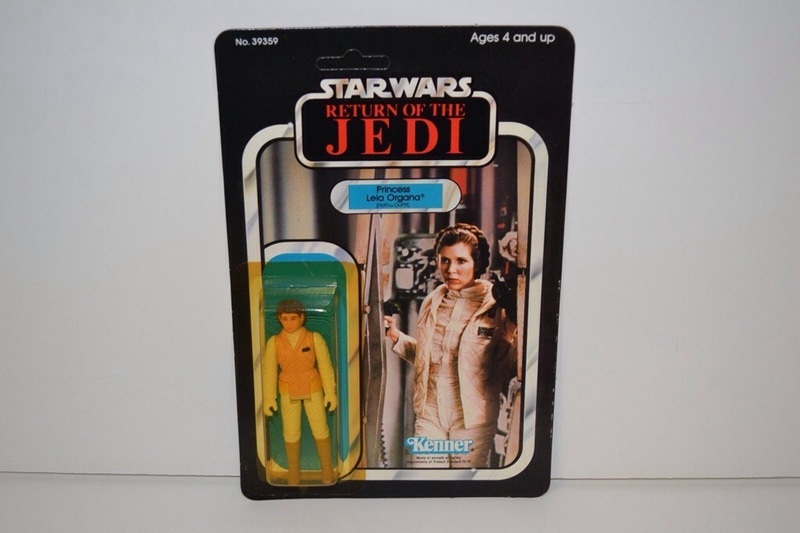 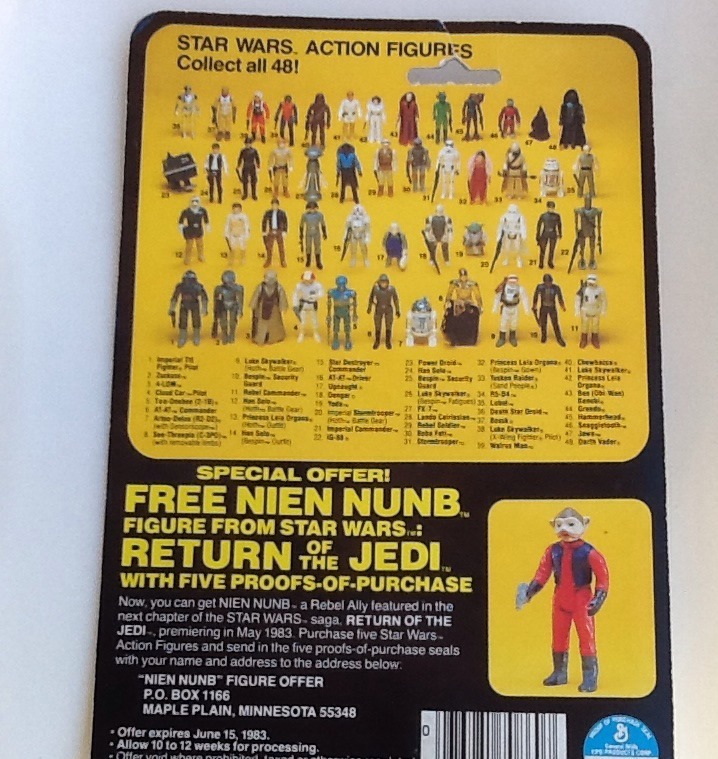 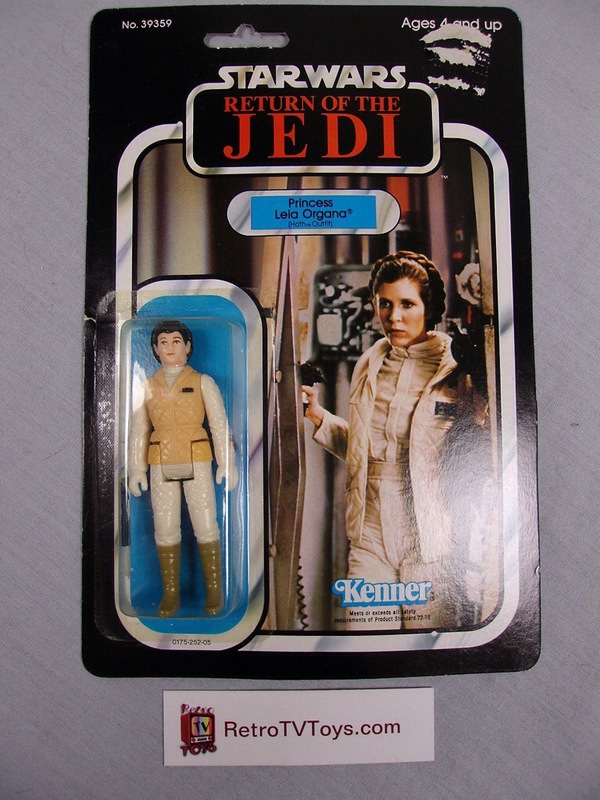 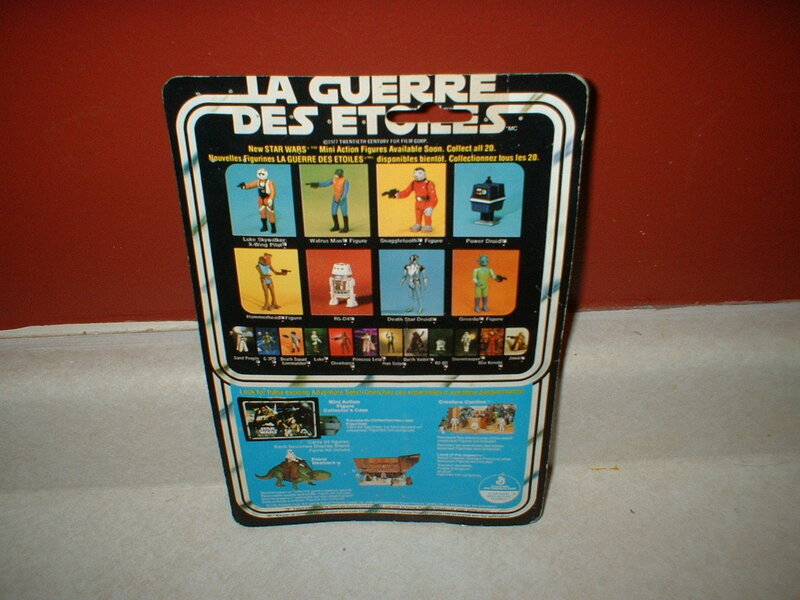 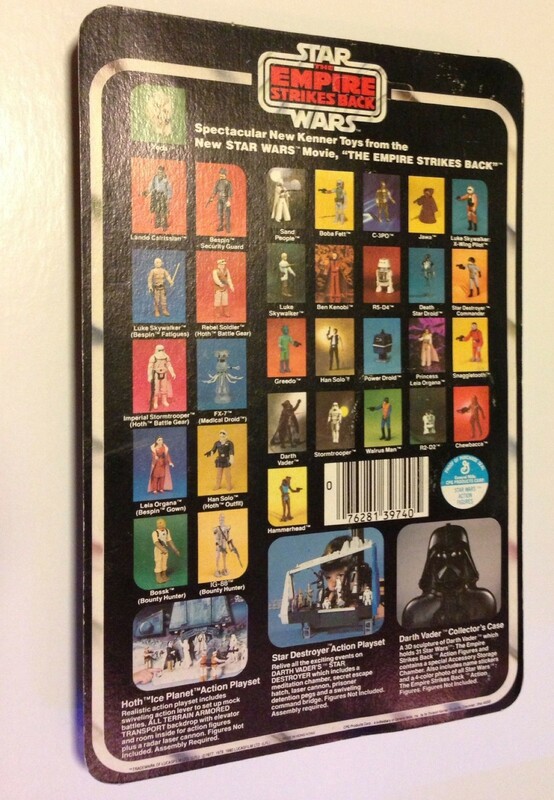 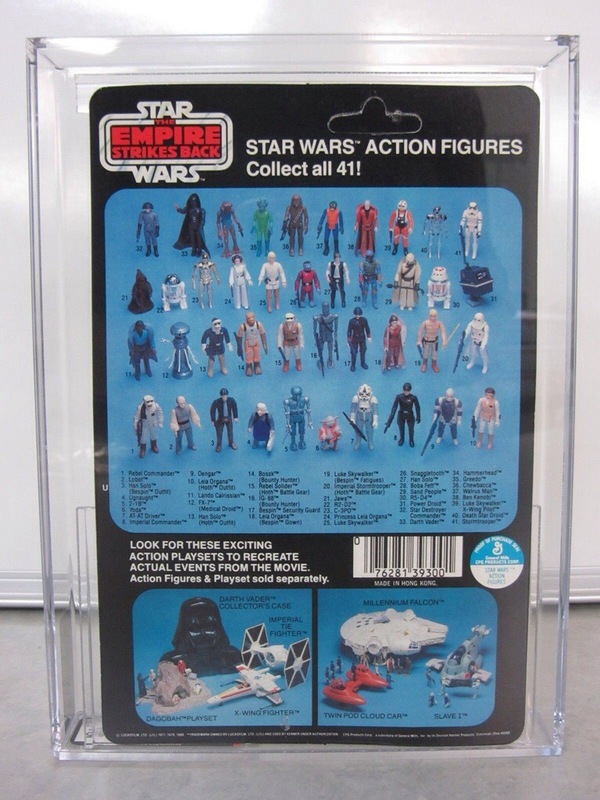 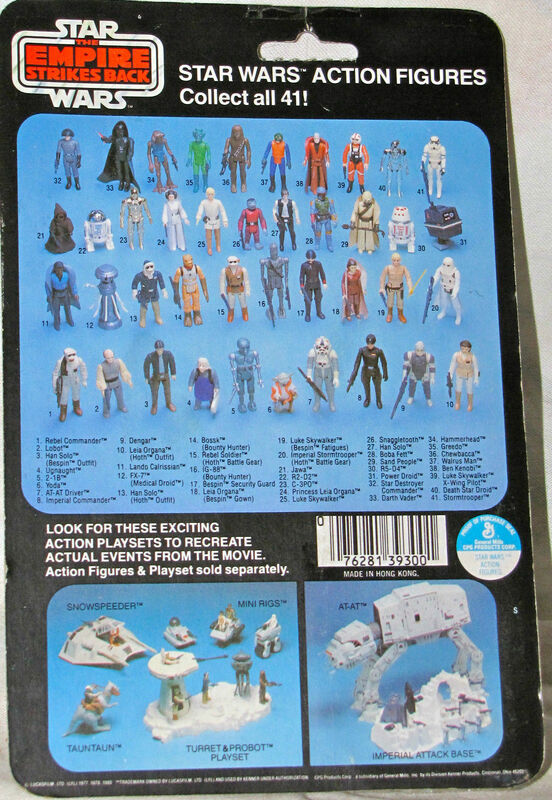 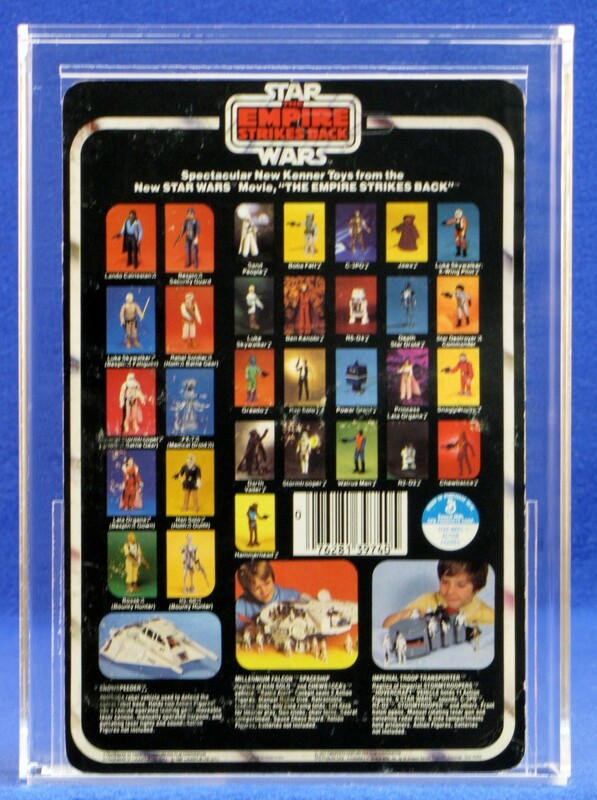 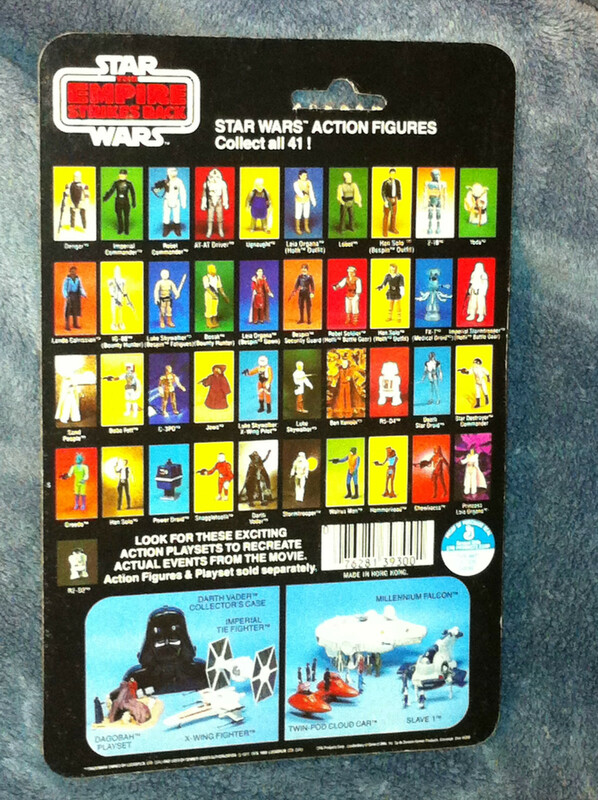 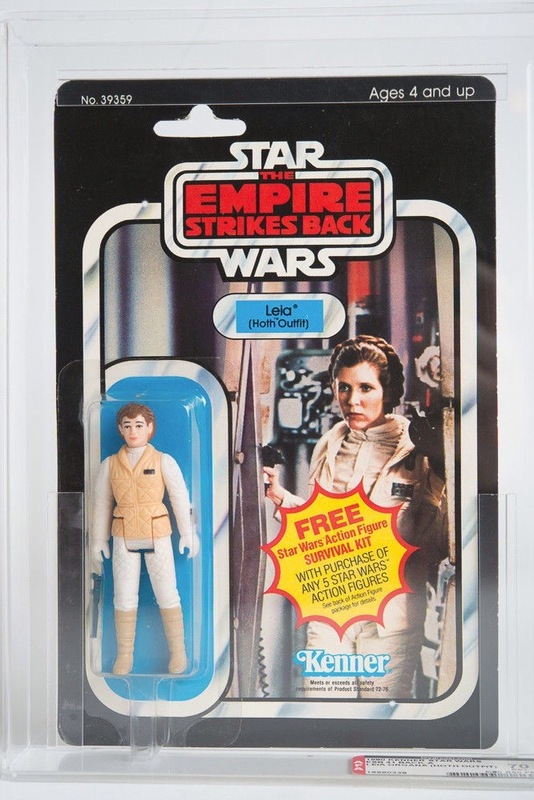 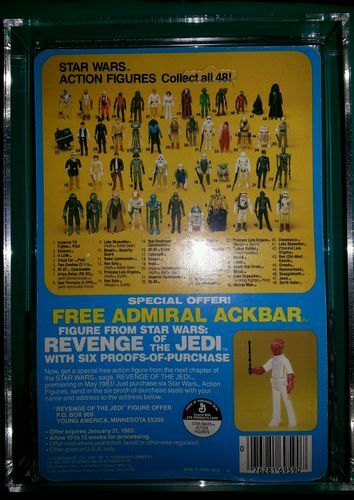 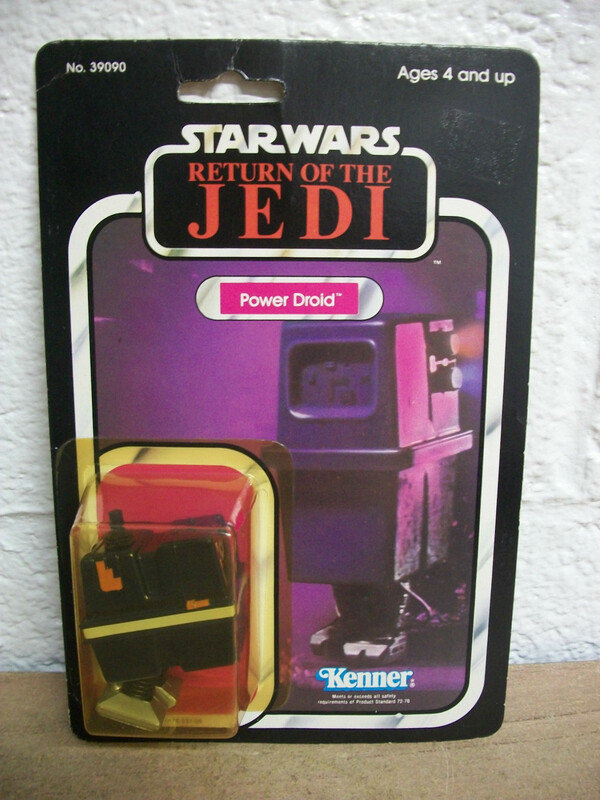 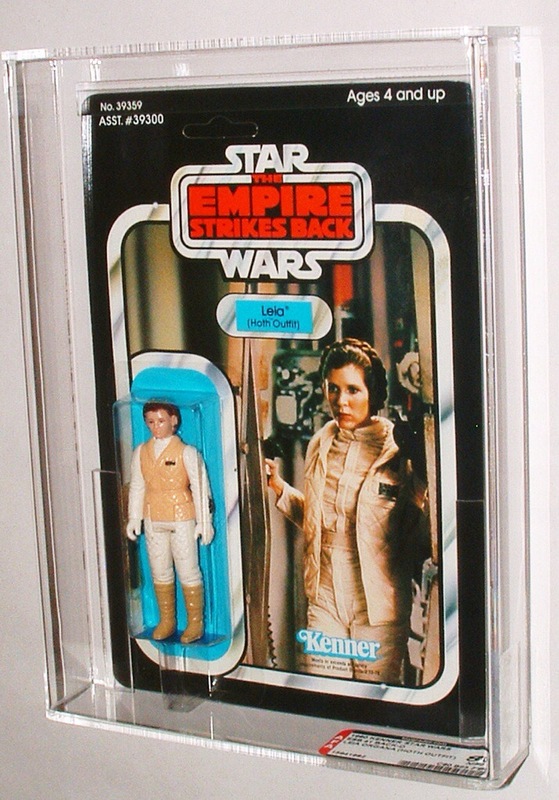 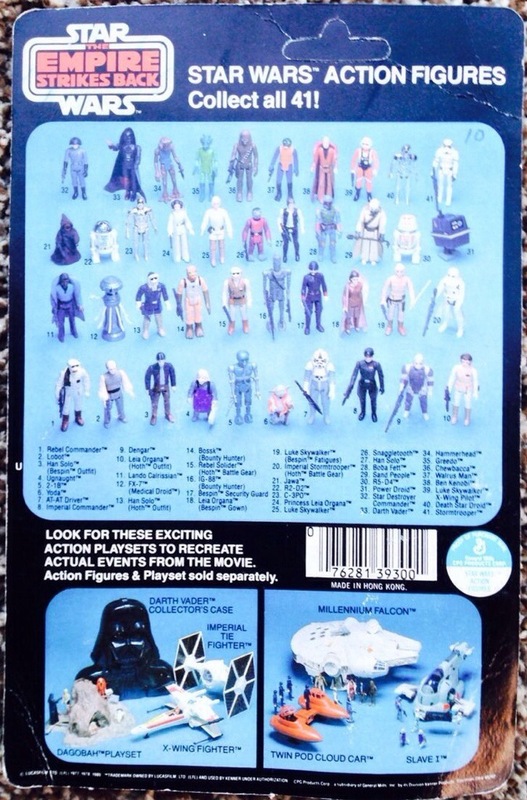 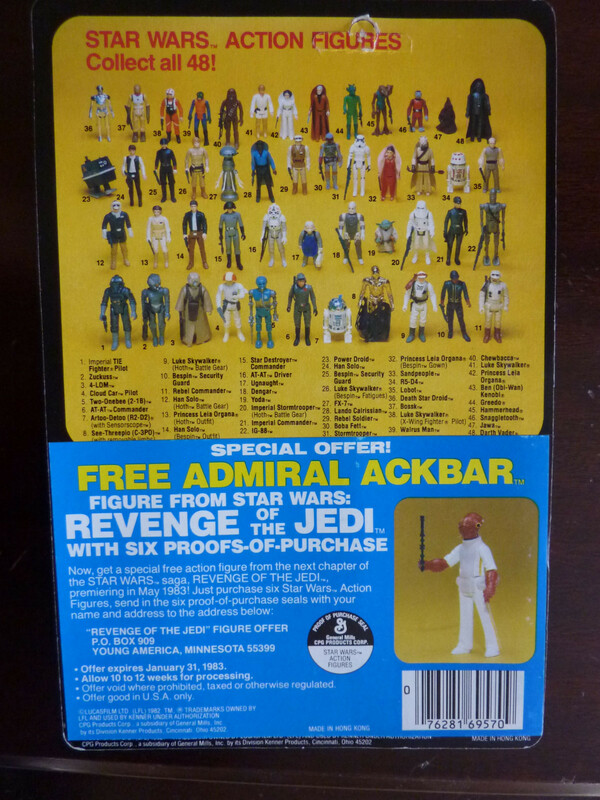 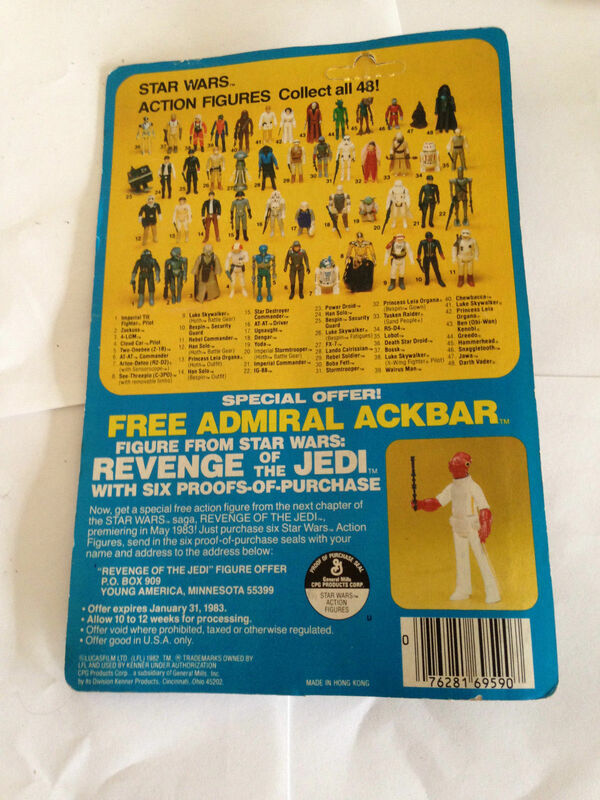 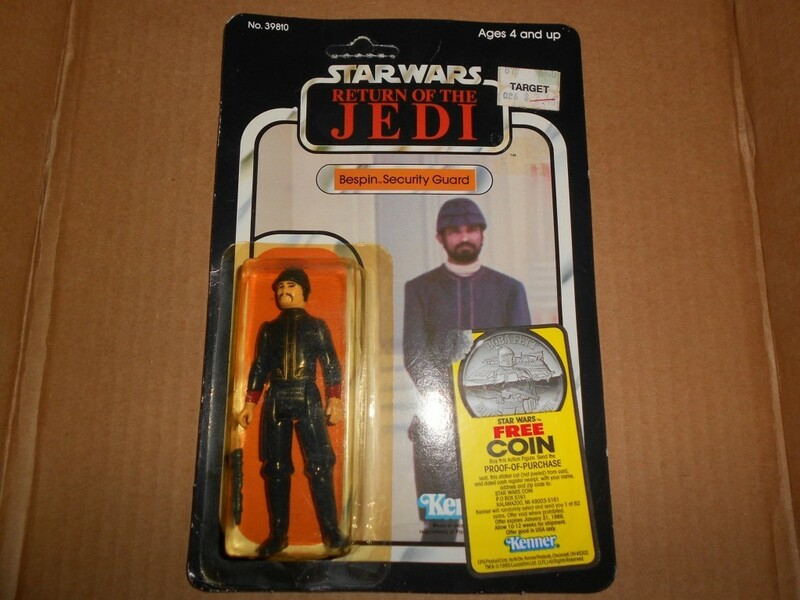 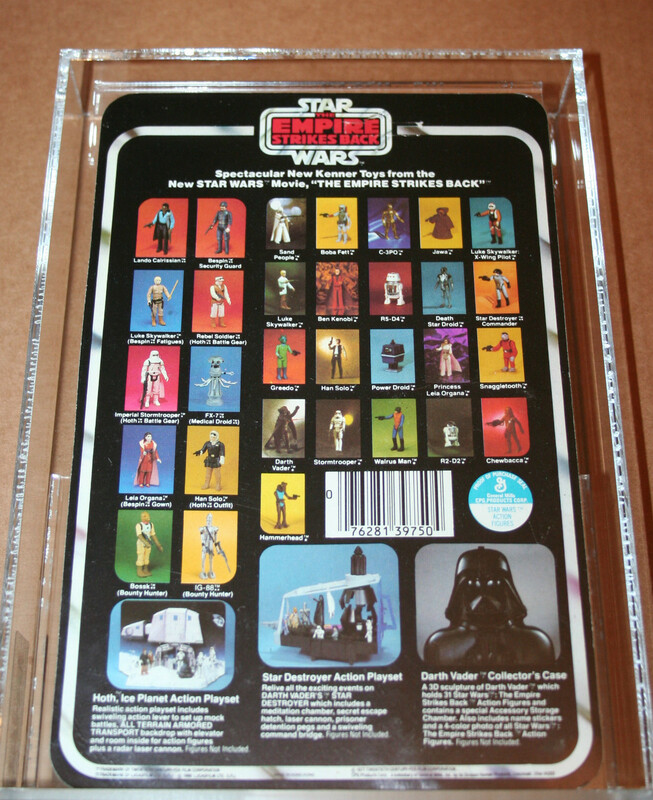 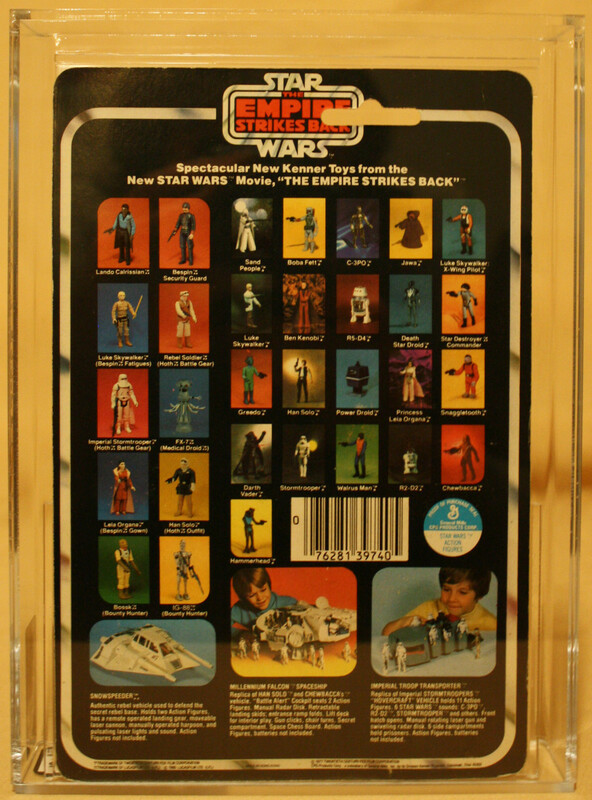 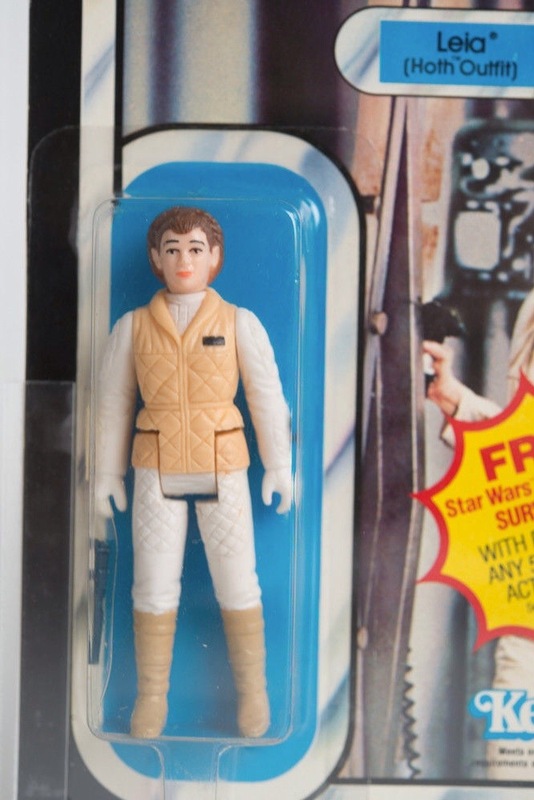 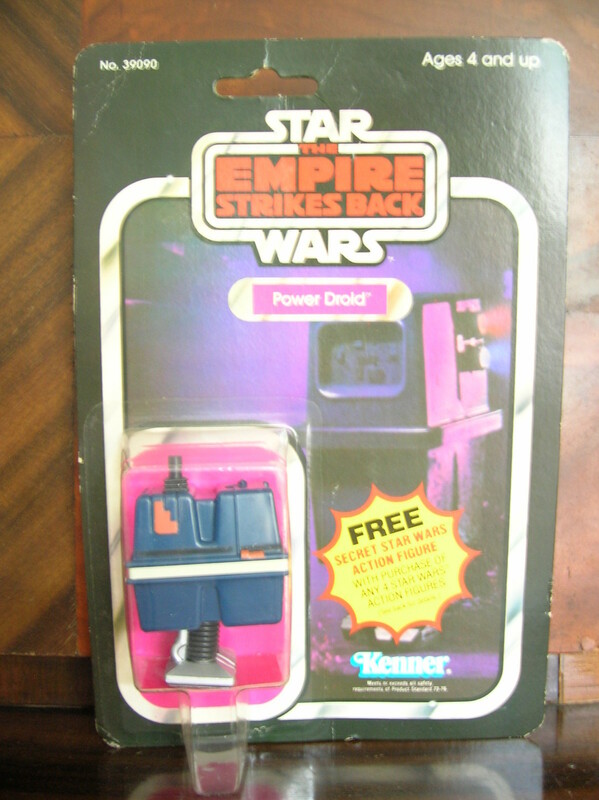 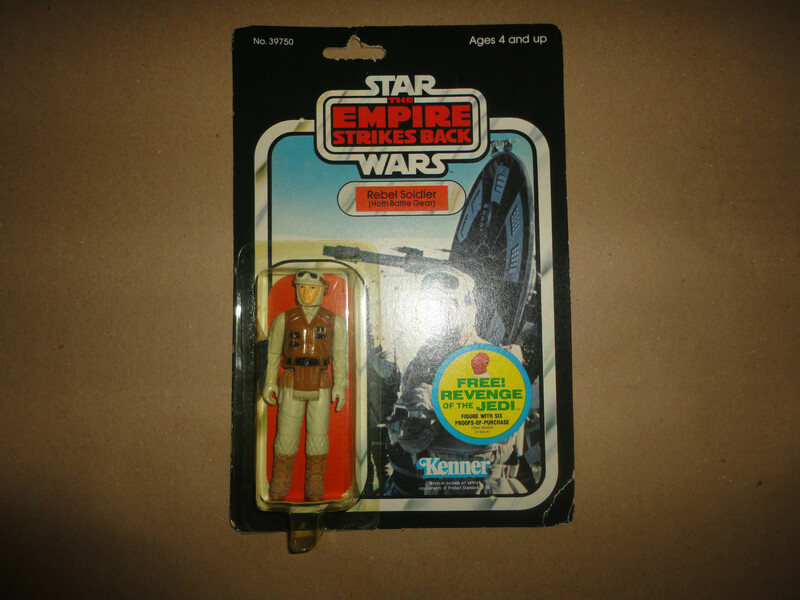 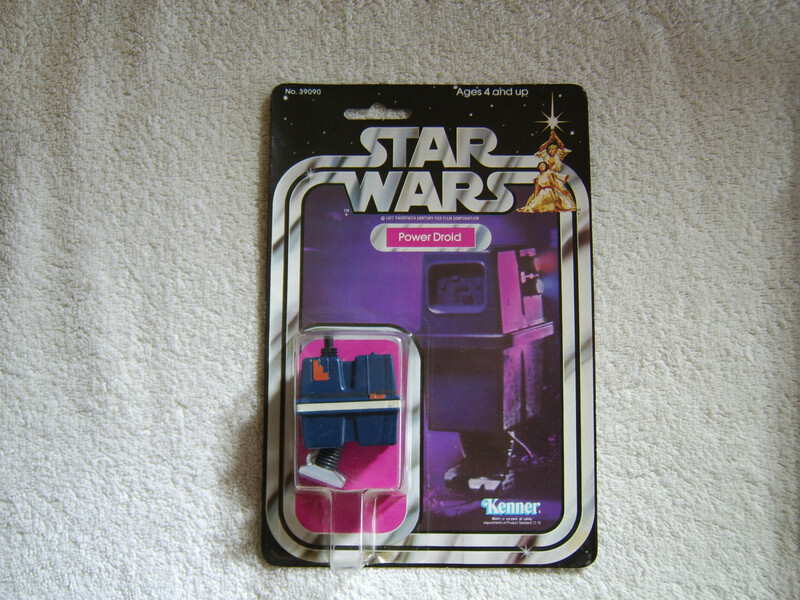 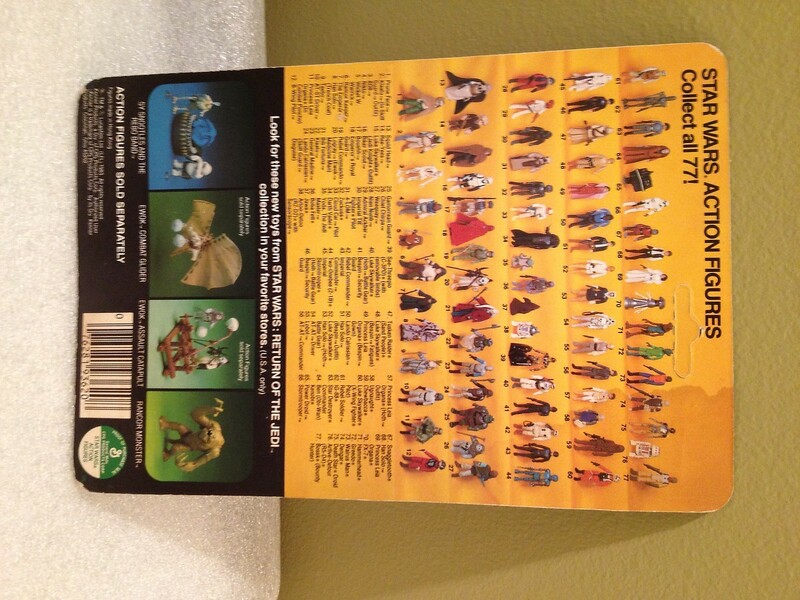 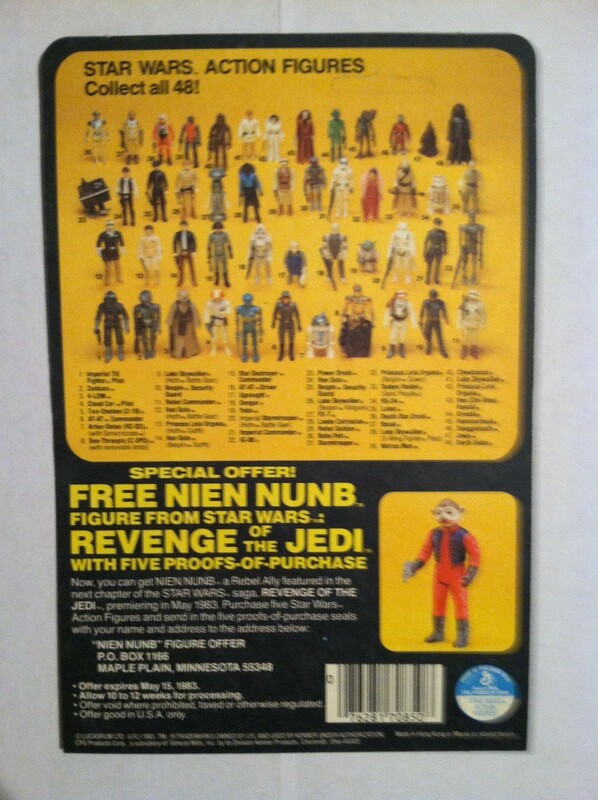 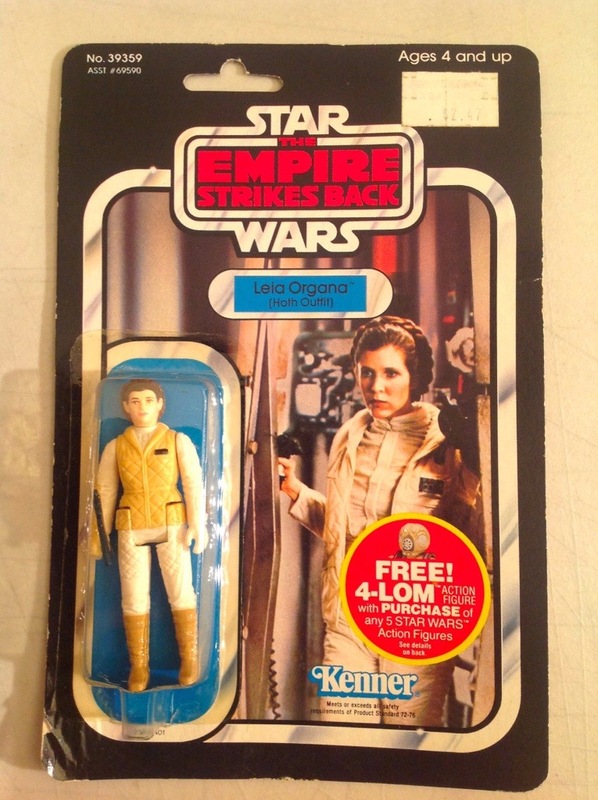 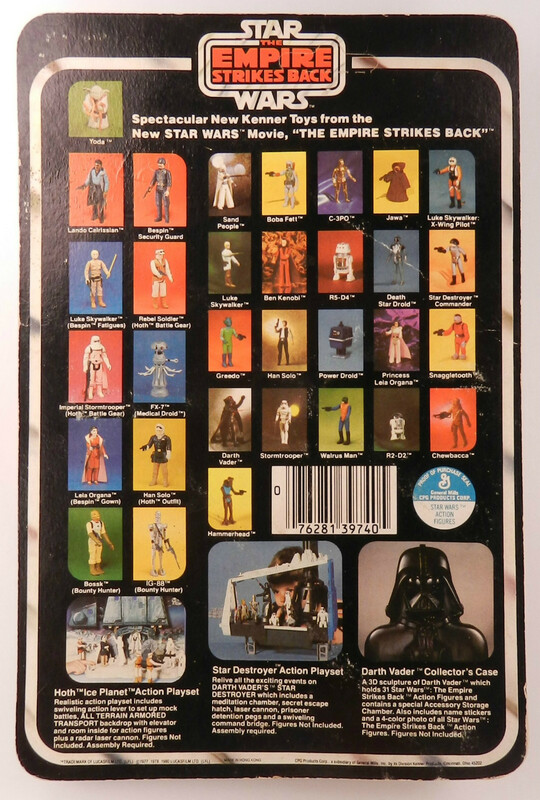 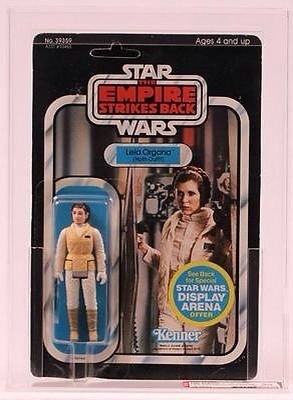 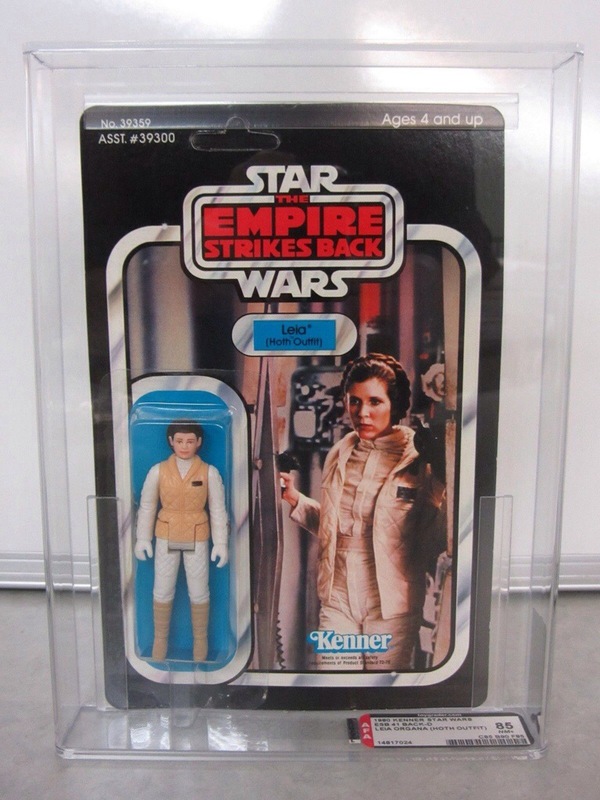 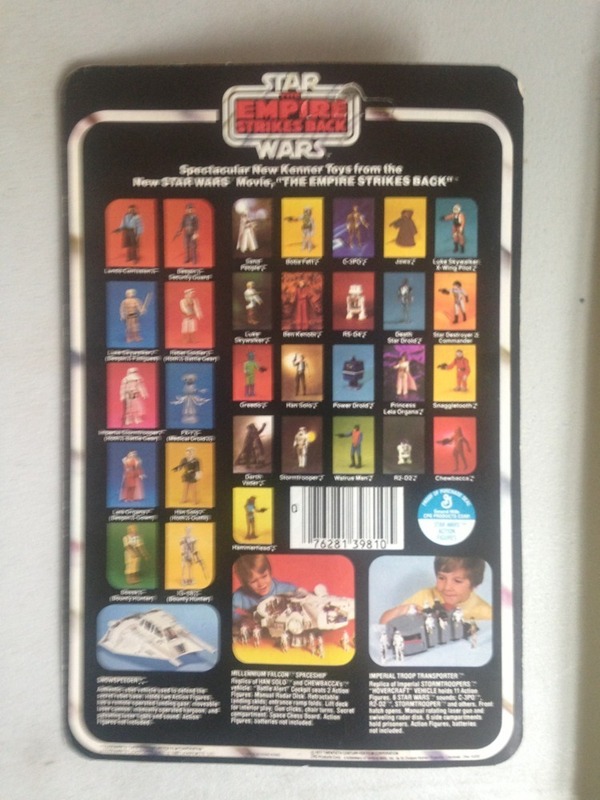 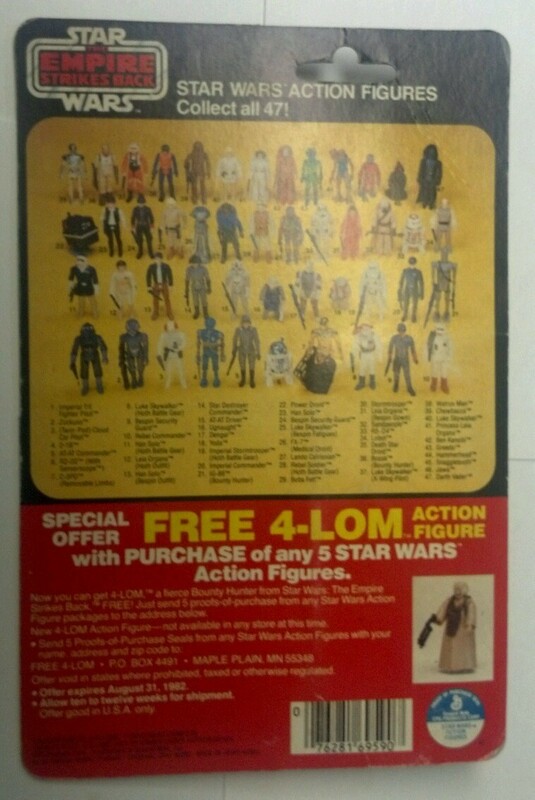 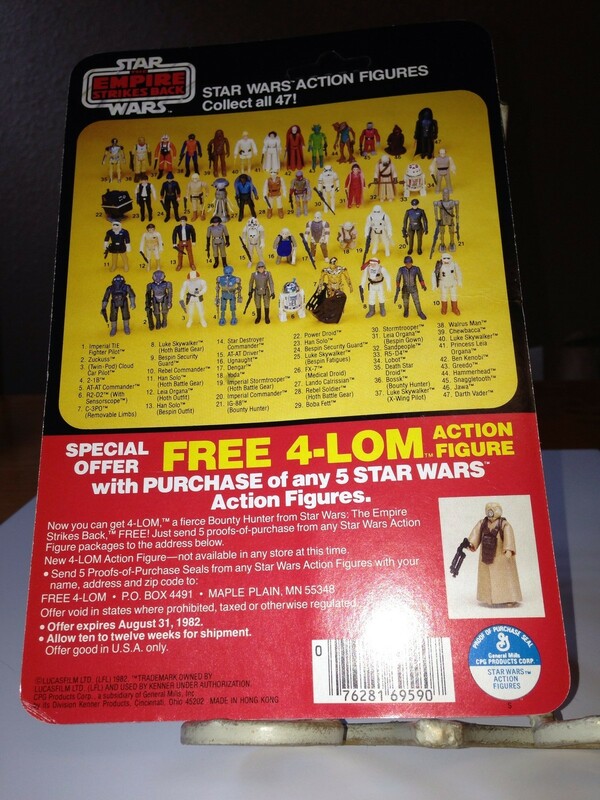 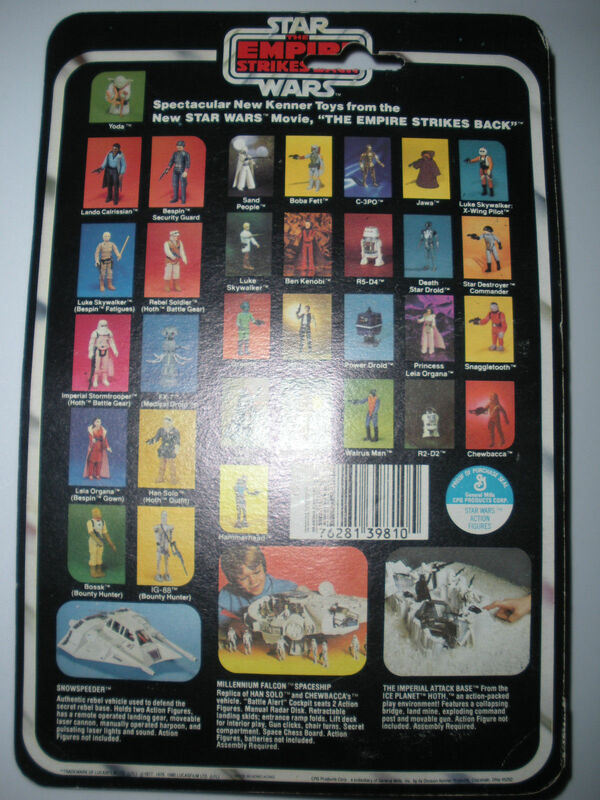 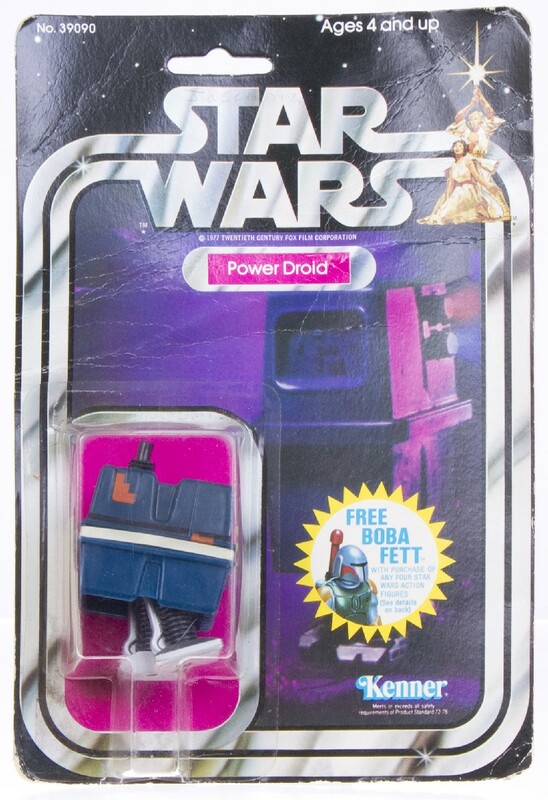 This cardback is pretty rough – but shows for even a relatively small sum of money you can have a figure from the original 20 figures on a Star Wars cardback. 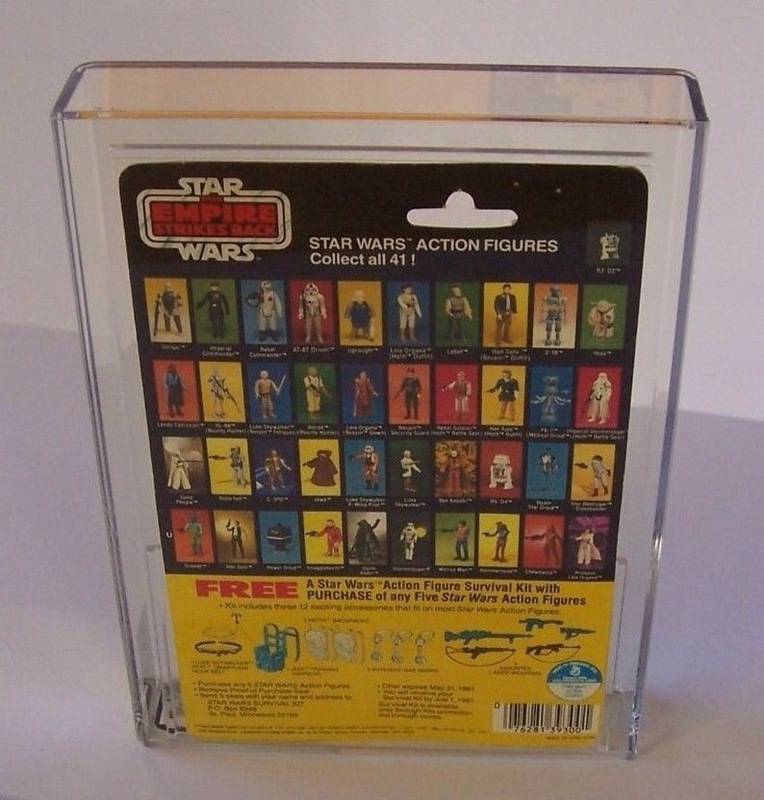 If you put this in a clear case (acrylic or starcase) it would look pretty decent and is a great bit of history. 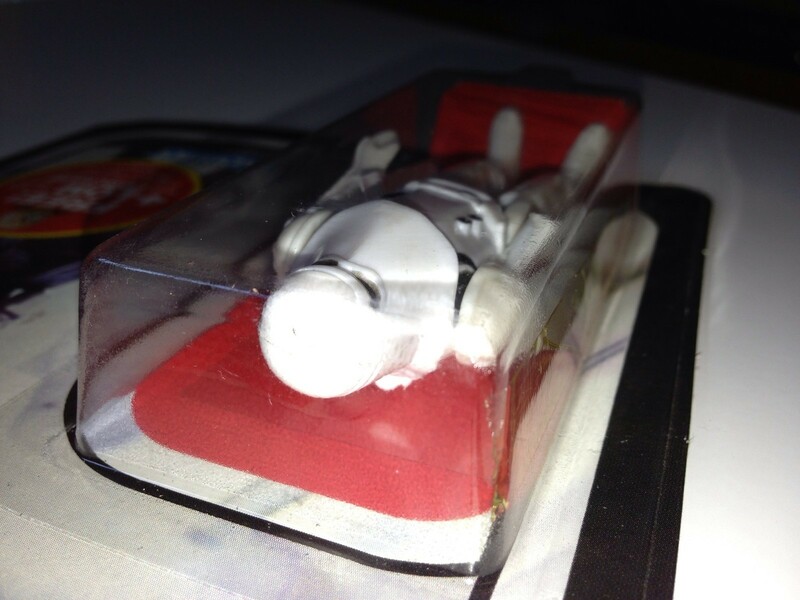 However there’s a high chance this was bought and sent off for “U grading”, but we wont go there! 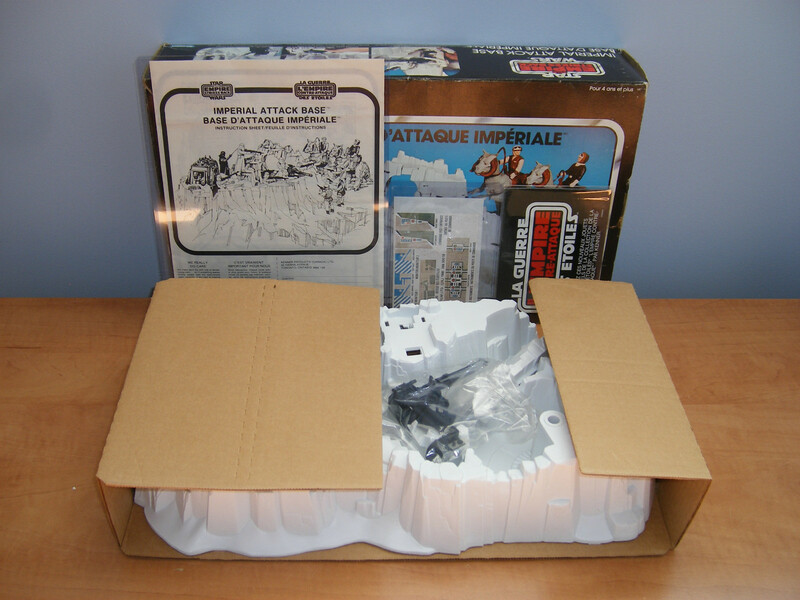 And these next two show the power of an AFA85 – big premium over the AFA75.. 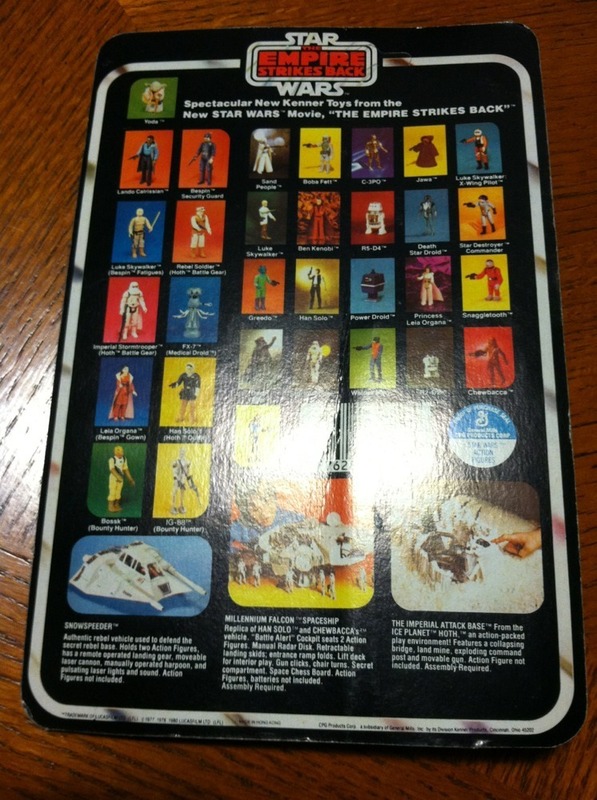 I found a few ESB cards with offers. 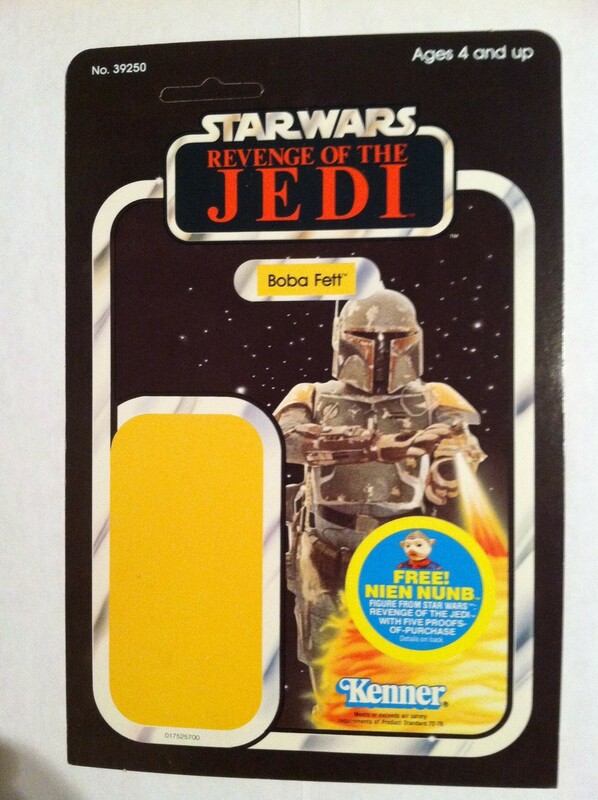 As I’ve mentioned a few times I was initially not a fan of the cardback with offer, but once you get a few you really appreciate them, and its also neat to think to back to the actual time the offer was “in play” and you would send those POP’s away. 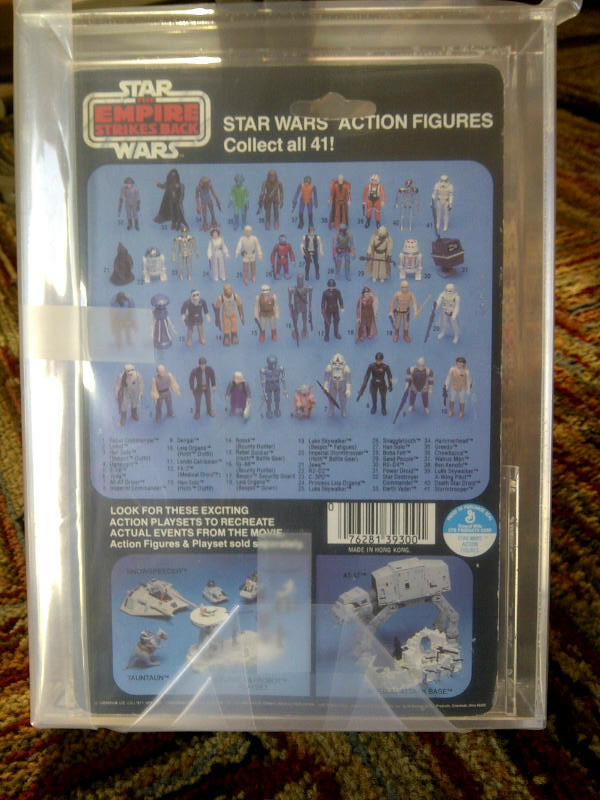 Waiting for that little white mailer to arrive with the figure seems like an engrained childhood memory for lots of us. 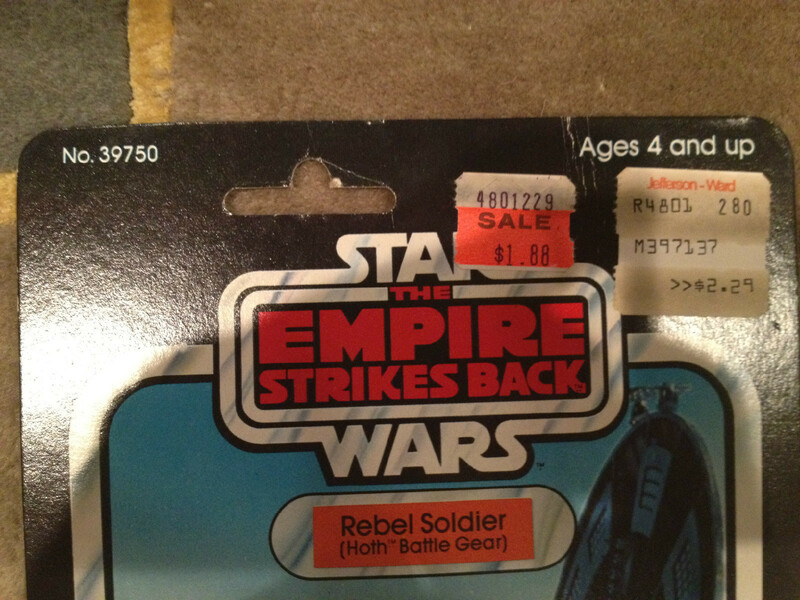 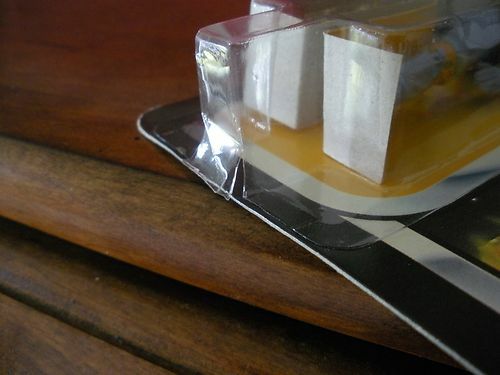 This was actually pretty rough on the back – the “Secret Offer sticker had been partially torn off. 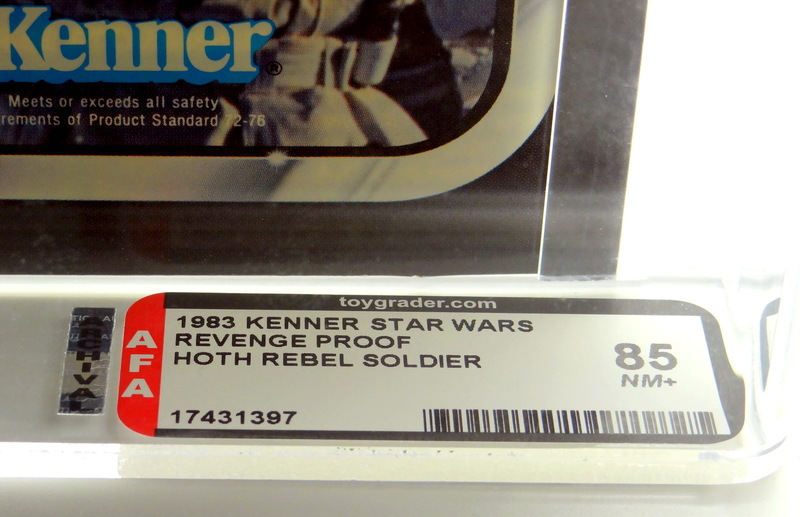 I know Skye mentions this but I’m also surprised just how cheap these proofs can go for, given how rare they are. 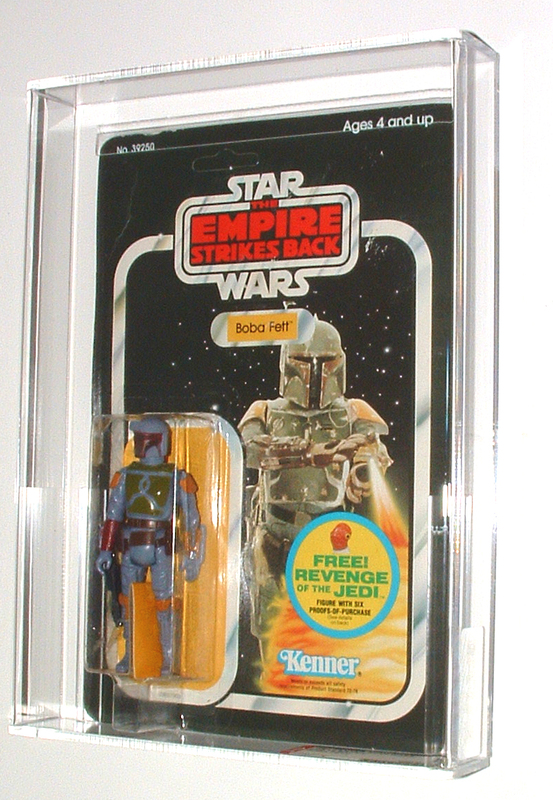 This was a nice example and hopefully went to a focus collector, as a pre-production item in a character focus really helps set it off. 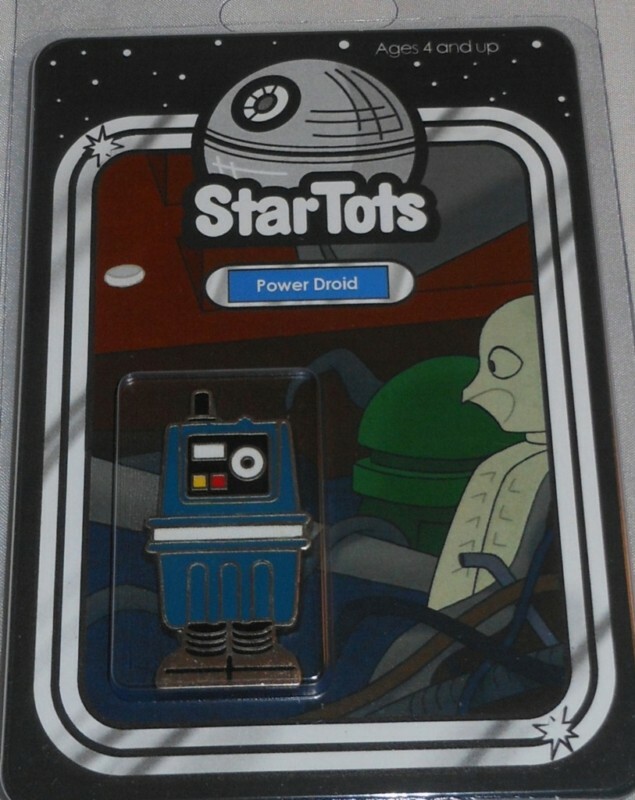 These Star Tots were really well done. 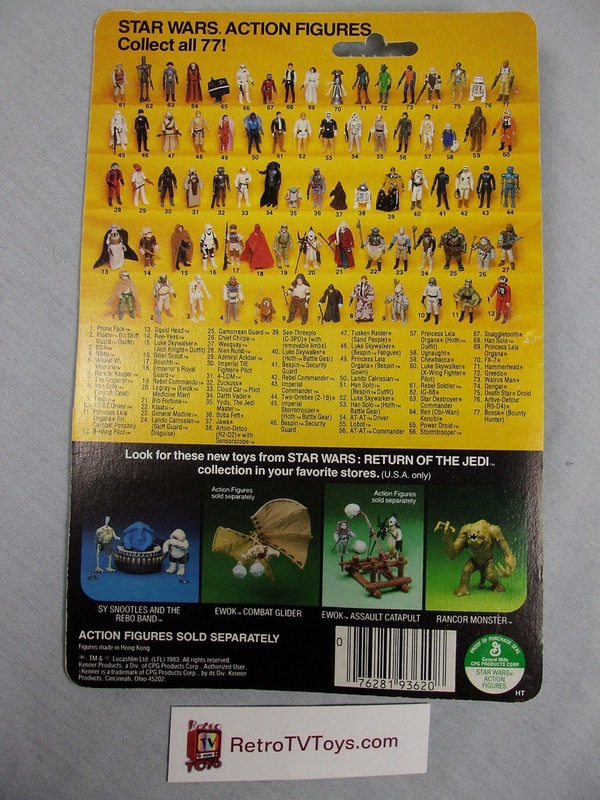 Having not attended CVI I didn’t pick any up and I did hear a few stories of just how popular they were. 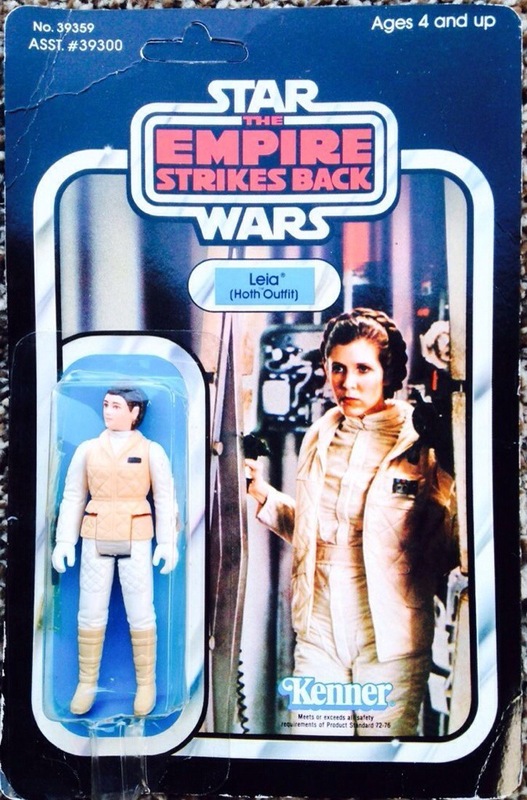 Kudos to the team who put these together.